It is amazing to see the community in action again. The plan was to start at 10 AM today. There was an unexpected technical glitch, Mic was not working. By the time we got to fixed, it was around 10.30 AM. After that when we started to add people, YouTube showed up 500 error! It was a dead end for us, we could not do anything. There was few wrong email ID’s given by parents that were creating issues, we found this and fixed it. But later again google started to throw some unknown errors. By the time when I was ready to start, it was almost 12 PM. Parents patiently waited all the time, many parents quickly started to join to lend their hands. Though we could not get their help since everyone was at the different location. Usually, when we do webinars (a couple of times in last five years) we used to use my ex-office, so we had a team of parents to support. Now this time, I wanted to do at home in my own space, as we plan to do more this year. 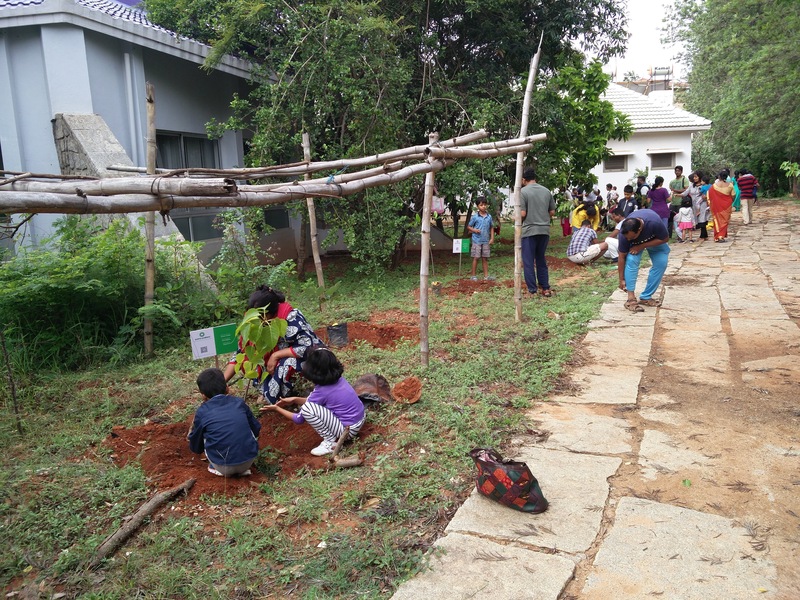 With few parents added, we started, in parallel @Devika @Sindhuja @Divya tried their best to add the missing parents. Since the recorded version is going to be provided I went ahead and started. One thing I wanted to make sure that I do not want to miss the knowledge coz of time. So the target was 3 hours, but the webinar went well smooth and lasted for 3.45 hours. 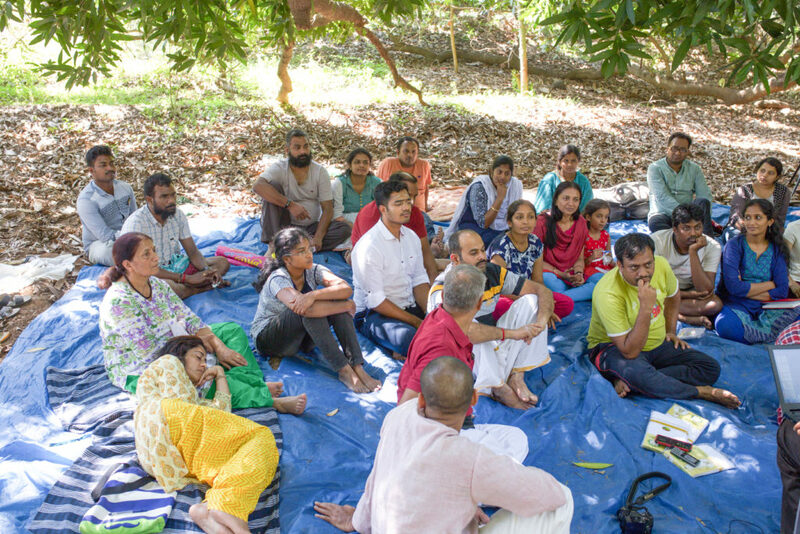 Shared the detailed spiritual, scientific and common sense point of view to 16 key samskaras and the remedies that we can do, if we missed the bus. Including me, where I missed most of the time when I was one-sided with science alone and following atheist. Good to see parents shared their feedback, some emotional moments did rise, some touchy and emotional topics might be the trigger, I myself was in tears during the session, as a parent I too have missed many moments of life. At that time I neither had the knowledge nor was patient to learn. Now I know and I am trying my best to go for remedies and reap the benefits. For the parents who enrolled and who could not make it to webinar can now watch it. I plan to have this live for a while. So do not worry. We will close the dedicated group soon I am planning to keep it open for a week. So if you have doubts you can ask. I will answer at my free time. Later we will close the group and we will use the open group to discuss. There is still some ongoing issues with swp’s YouTube account. So, for now, I have used my personal ID to share the private video. Knowing is not important, practicing is important so please implement the learning, only then the time and efforts of the community will be benefitted. And this is the only way we can show our gratitude to our ancestors. End of the day we are doing this for our own self and for the next generation to build a healthy society. As said during the webinar, the next session will be a 24 days practice of Sacred Sleep and Dream therapy (SSD therapy) will start soon. We will share the details later. Have only partially seen the video..But everything I saw was very informative…Thanks a million for the efforts you have put in. Please continue the good work. 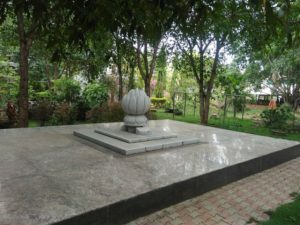 Vaazhga valamudan vaazhga Vaiyagam. I got the knowledge about the Sanskaras which I would have never known. The best part was that everything was explained by giving scientific reasons, the kind of theory which I agree on. Once again Thank you, Velu Anna, for giving us such a vast knowledge. The session was amazingly great as the contents shared were very deep and long lost in current culture. Whenever Velu Anna uploads a video definitely I will get knowledge from it.. I am very happy that I came across such good people..
Amazing information.. Thanks for sharing.. I am so happy that I ve learnt many unknown facts in our life. Amazing to know the reason behind it. I feel guilty that why I get this info so late. My since thanks and gratitude to Velu Anna. Webinar was really great  It has given us indepth knowledge of our samskaras. Remedy for each samskaras to balance it, if we missed doing anything. Spritual and psychological reasons behind each samskaras are explained well. Thank you so much Velu!!! Wonderful. I learnt a lot from this webinar. I am sure it must have been a lot of reading/research for this webinar. Grateful to the committed group!! Wonderful session…. much needed for this generation (for me)… Thanks so much for sharing knowledge about ancient holistic living. Gratitude and Pranams. Also I’m eagerly waiting for 24days online program…details about it.. as I live in US. 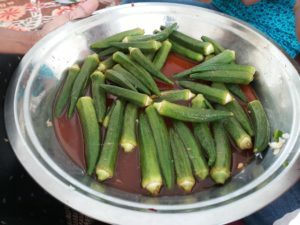 Even though we have heard about the samsakaras the readon behind those were always unanswered by all elders at my home. It was really so informational and surprising to understand those samskaras and the fact behind it. i am really looking forward for more info about the spiritual world. Good. High content. Very tough to follow. Could be done in 2 days. How do we ensure that, maximum people try this? Don’t use plastic carry bag will reach less people. 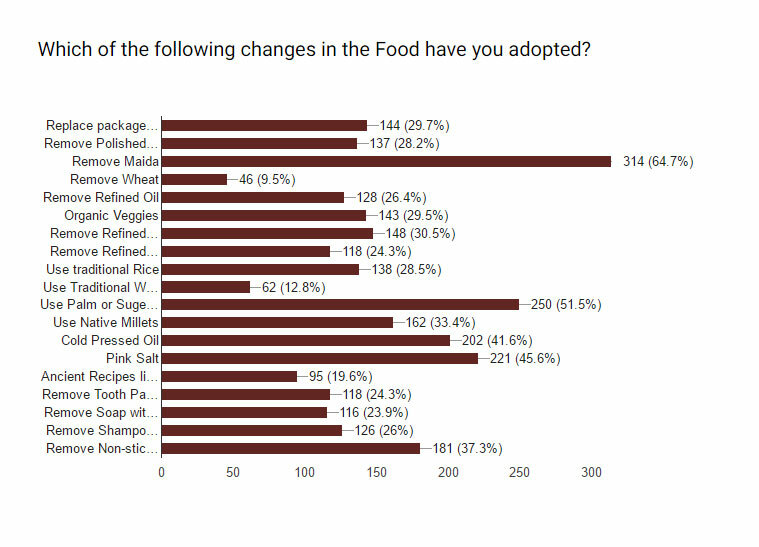 Introducing eco-friendly/comparable plastic bag is the solution. Our people needs a kick-off and easy start. How r we going to help? Knowledge sharing is great, because we don’t know these information. 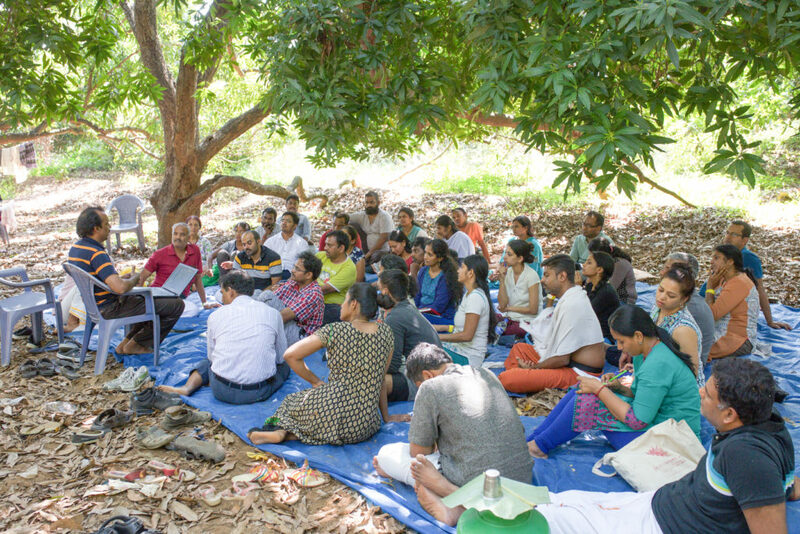 How can we help the society to practice and come back as original form of ancient living? The meaning behind each samskara is very well thought by our ancestor is refreshed again. 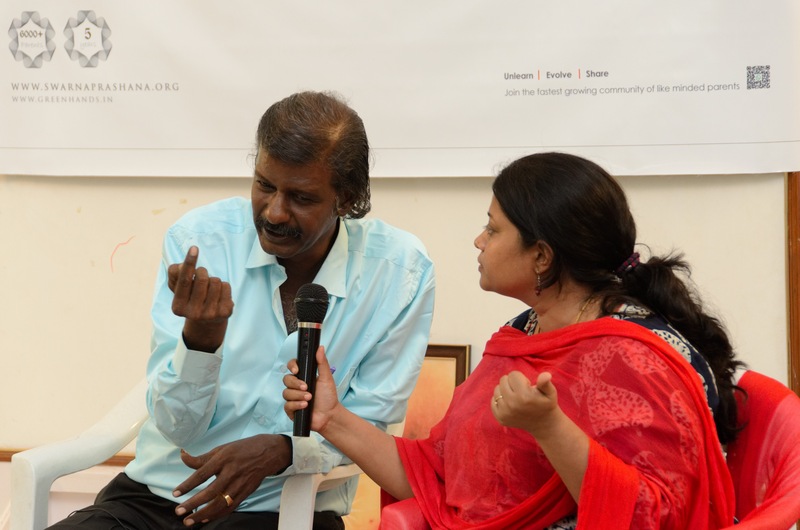 And I think the effort that Velu took to pass this on to this generation is imperative and appreciated. 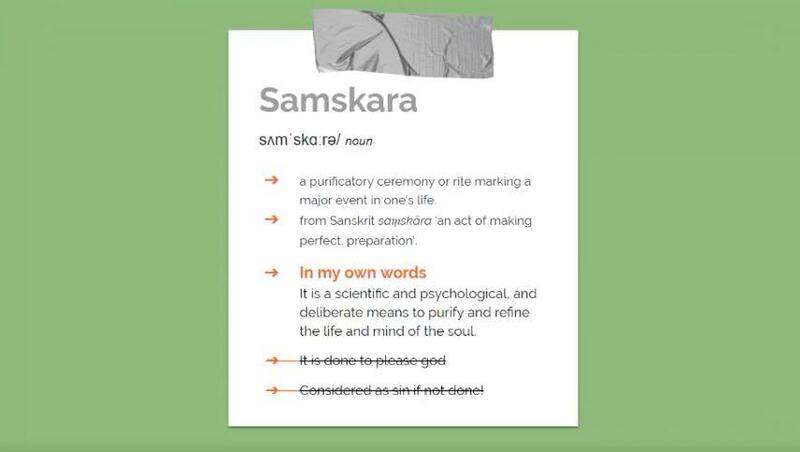 The meaning behind each of the samskara is very well presented. I really appreciate your effort in taking this initiative. 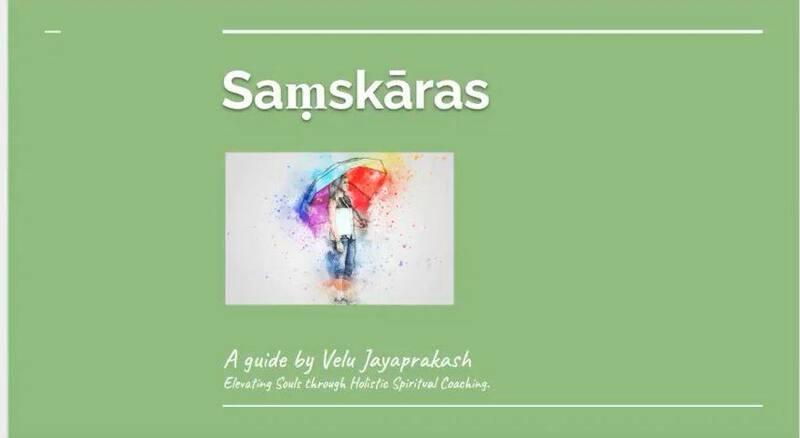 The webinar was very informative and an eye opener regarding our ancient wisdom on Samskaras. I want to be journy with all great persons,want to learn more. Very informative video. Happy that I registered for this program. 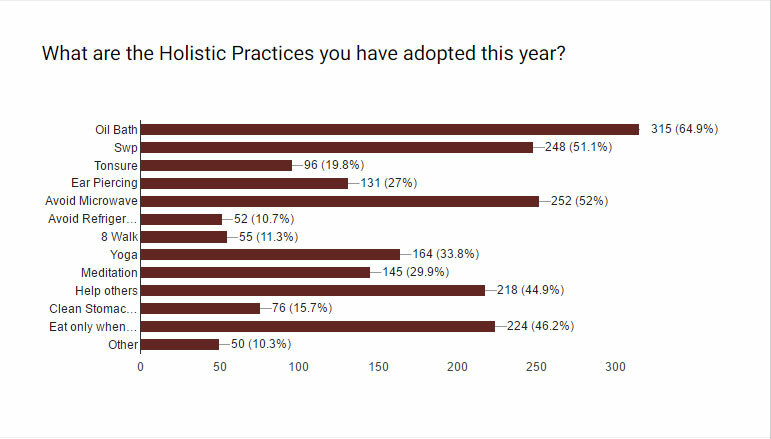 Excellent, glad to see we’re discussing deeper spiritual topics than primary Heath and wellness. Very informative and in depth info. It was Interesting and elaborate. Suggestion, references can be included. Thank you for sharing your knowledge on this expansive subject. Enjoyed the webinar so far. Yet to complete. Viewed only half of rhe video. Unable to view offline. Mobile data empty. It was very informative, could have been more elaborate. Te session was fabulous. It was so informative that one viewing is not enough. Need to view it so many times to understand all the different meditations. It was very interesting, informative program, an eye opening session .. look forward for many more such sessions. Very informative session. 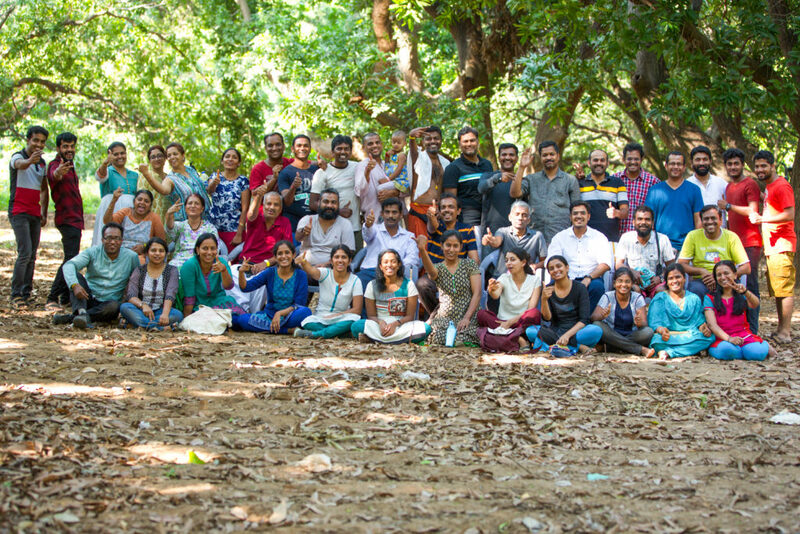 Thanks Anna for all your effort to make it happen and sharing worthy knowledge..
Samskaras gives a systematic and disciplined way of living. I am really happy to know these and change living style at least a bit and carry forward our rich culture to the future generations. I could say this is a kind of GEM knowledge. Thanks Velu Anna from the bottom of my heart. 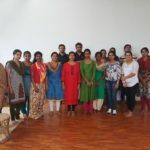 About siddaras, pranayama so on. . Parenting and child mentality. It differs from kid to kid. How to handle in a right way. Why special children born? How to correct them spiritually. What to do to make them more lively. Decoding mythological stories and significance of different gods and godesses to understand the meaning and logic behind them. Can there be a seminar on daily lifestyle and must do spiritual/ ancient practices in daily routine. Birth stars …how to raise childrens to be on spritiual path . how to know their creativity , how to increase the decision power of childrens . Has anyone actually seen spirits??? Do they exist??? Is there god, where??? Question asked frequently but I still don’t have the answer…. 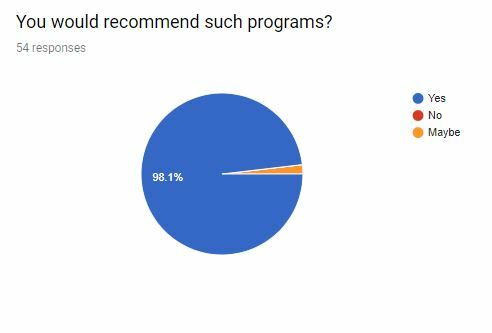 I am not sure if this is the forum for this question..But here goes…” Can you please tell me worshipping procedures to be followed at temples especially navagrahas? There a lot of books and you tube videos, but contradict each other…I am confused as to which to follow. 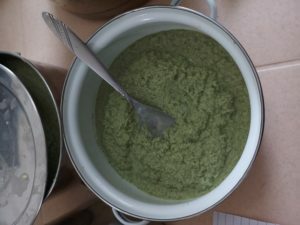 Would like a webinar about our ancient food. 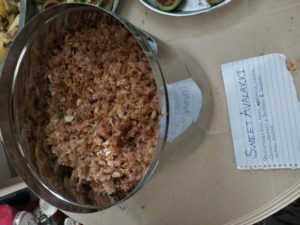 About saatvik food – how and what to eat ! Astrology, the importance of rituals in daily life, significance of powerful, energetic locations for social growth, connecting with ascended Masters, the spiritual significance of deities, mastery of internal functions, expansion of our brain function, to name a few. Specific meditations. I try to follow the full moon, new moon and cycles meditation and it’s so fulfilling. The second day dawned bright and early. 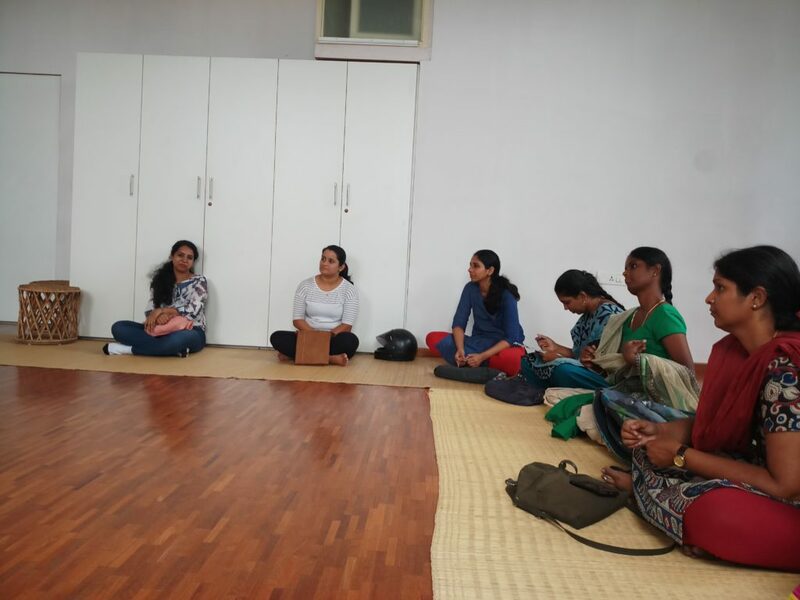 The first session of the day was Yoga – guided graciously by parent Bhooma. 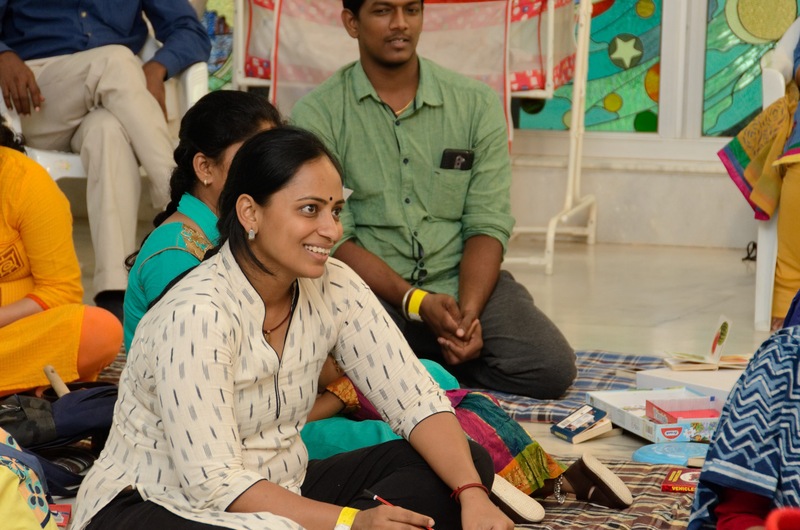 Though Bhooma did not have any indication that she will be called on to conduct the session (as the other person who was supposed to do it had to drop out due to unavoidable reasons), she enthusiastically stepped in and ensured the parents were not disappointed. I heard the Yoga session was very energetic and rejuvenating. Unfortunately, I missed it! The early morning chirping of the many birds on campus and the peacocks from the nearby fields compensated a wee bit for missing such a wonderful session though (or so I consoled myself!). After a quick breakfast, all parents gathered at the pyramid room with much anticipation and glee for the day’s program. We were not disappointed. 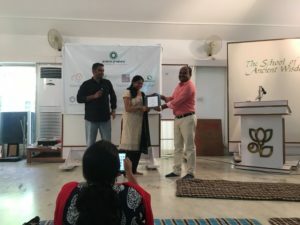 The formal program kicked off with a small recognition ceremony to honor the core parents who have contributed their time and energies over the last few years towards the growth of the Swarnaprashna parenting group. Without these do-gooders, our community will not be what it is today. Many thanks to these kind souls who continue to dedicate their efforts to the cause of holistic living and parenting. 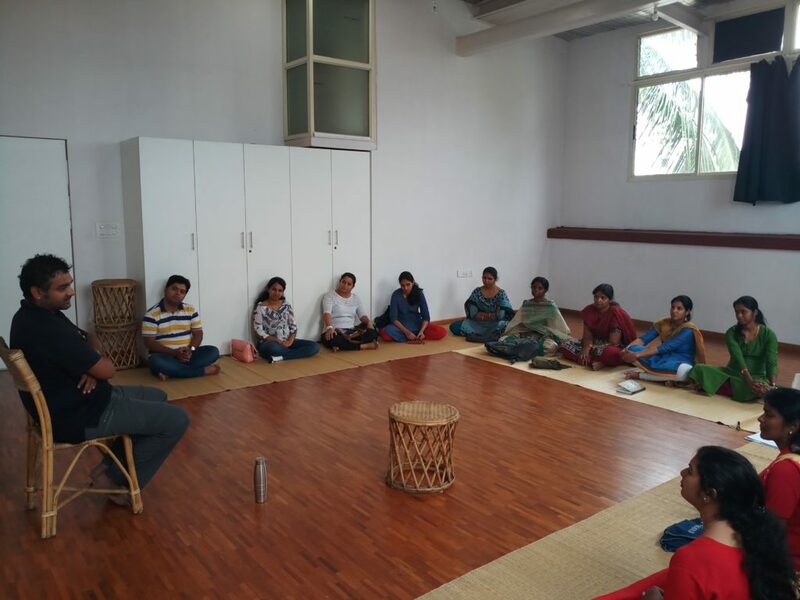 After the recognition ceremony, Ranjan Mullaratt, a Kalaripayattu expert with 30 years experience in the art form, spent over an hour with us sharing his knowledge about the most ancient martial art of the world. Kalaripayattu (Kalari meaning an enclosed space and payattu meaning practice), which is said to have originated from South India, is believed to be taught first to Sage Parasurama by Lord Shiva. The art form was eventually spread world-wide by Bodhirama including to China. Today, it is practiced widely in Kerala, Tamilnadu and Andhra Pradesh in India. Placing a high importance on the guru-shishya parambara, Kalaripayattu is extremely beneficial for both physical and mental health. It follows the principles of Ayurveda and incorporates traditionally guarded secrets on vital nerve points to disarm the opponent in a fight. 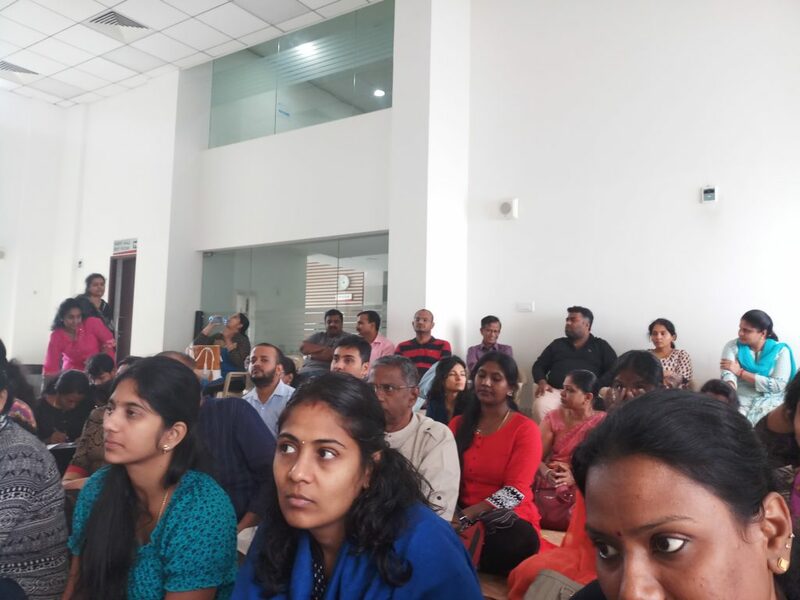 Next up was the super fun, super powerful, super thought-provoking session on Natural Foods by Dr. Maran G. A raw food activist and a firm proponent of Naturopathy, Maran G is what you might call a bomb of energy and traditional knowledge. 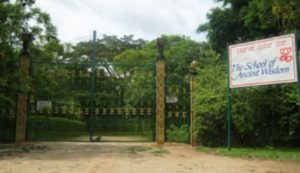 Dr. Maran runs a tiny food joint in Sivakashi, Tamil Nadu named “Thaivazhi Iyarkai Unavagam” (translated roughly as Traditional & Natural Food Restaurant) – it serves over 300 people each day with completely wholesome, raw and uncooked food and helps them fight many diseases and illnesses with food as medicine. The more flour/starch you consume, the more pain you will suffer. 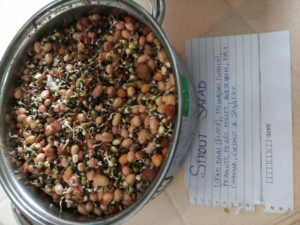 Avoid plan starch food. Follow the Natural way of life – have more fruits and vegetables (raw). 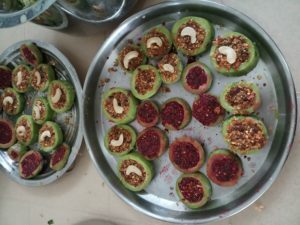 Consume Amla/Guava/Dates/Fig in plenty. Walking for 10 mins barefoot is equal to walking 1 hour in shoe. Try to walk barefoot as much as possible and stay connected to Mother Earth. A lifestyle without physical work and filled with bad food habits is sure asking for trouble. 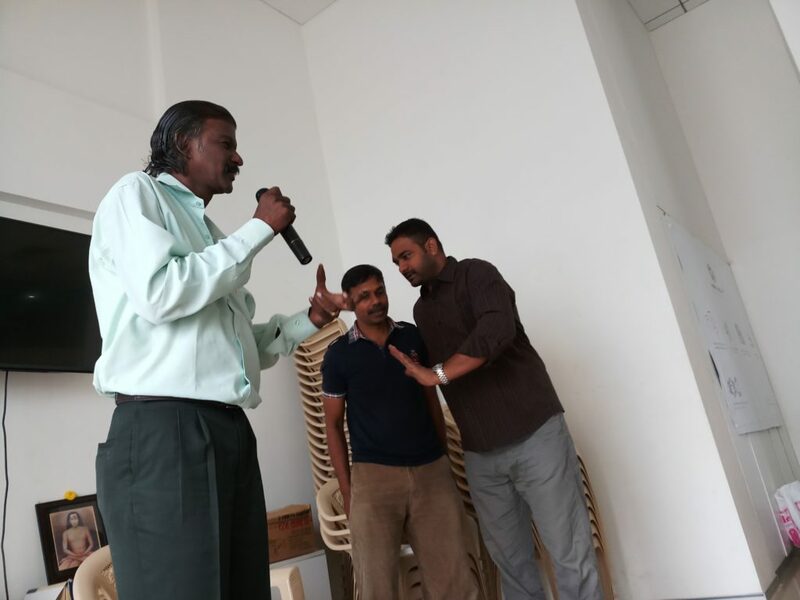 One must do the super brain yoga (thoppukaram as it’s called in Tamil, usually performed in front of Ganesha with both hands on the ears) at least 21 times a day to stay fit, young, and healthy. At least one meal a day must be Fruits only. Once in a day at least, you must do fireless cooking! For Thyroid, Diabetes and improving memory power, soak 2 Ladies Finger in water overnight and have that water in the morning. Try to have a wholesome and raw breakfast. 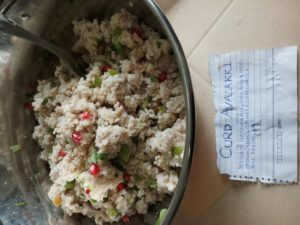 You can always add spice to it in the form of pepper, jeera, ajwain. Replace Coffee/Tea with Dry Ginger Tea. 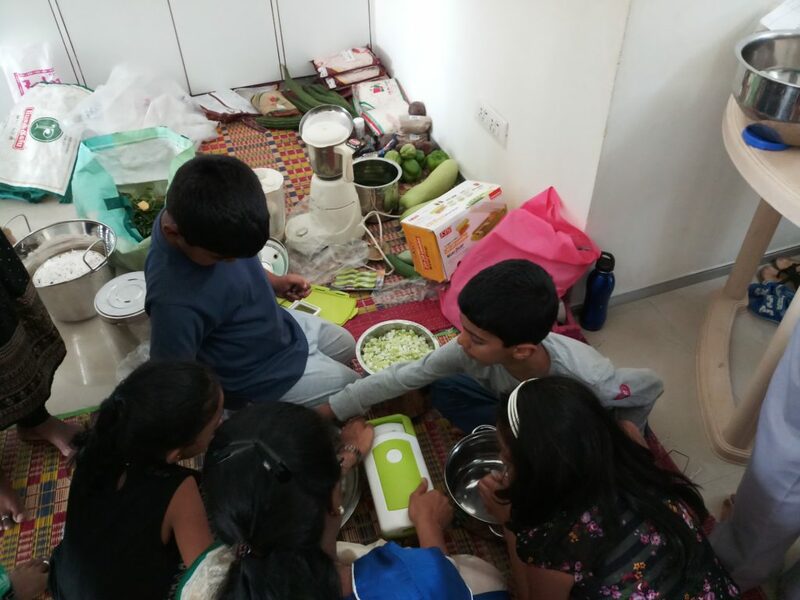 Most importantly, pls ensure your children inculcuate the good habit of eating raw and healthy food – enrich their water bottles and tiffin boxes with the best food Mother Nature herself has prepared lovingly. Do not watch any TV, mobile or other devices while eating. Never eat after 7 in the night! The above is just barely scratching the surface of what he shared. You must definitely attend one of his sessions if possible in the future. Standing ovation to Dr. Maran – one hour with him is just NOT enough! 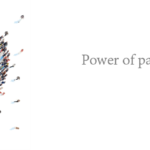 We all proceeded to lunch – thinking if we should start practicing all Maran G told us right away – unfortunately, bad habits formed over decades of lifestyle needs at least a few days of convincing one’s own mind and self before making the switch. Maran G, however, did not think so. He liberally shared his meager lunch of 2-3 fruits with everyone at the Lunch hall. Indeed, a very selfless Samaritan he is. Usually, any session planned right after lunch will turn out to be boring (even if it is not really so – thanks to our full stomachs!). But we had a surprise coming for us. 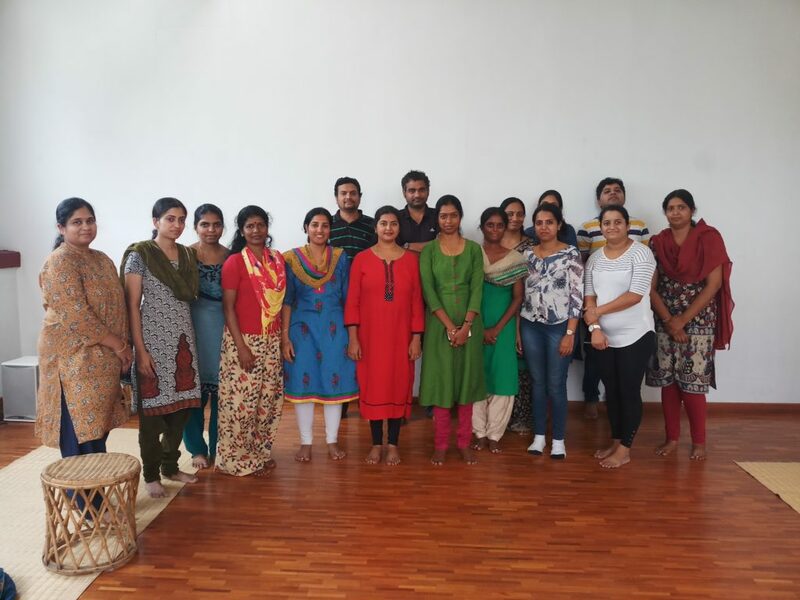 The team from Kreedaa Kaushalya, who came all the way from Mysore, enthralled us the next one hour with the traditional games of India. 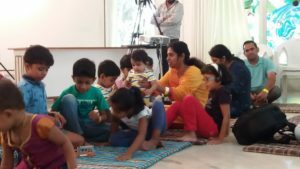 Right from Indian Chess, Pagaday, Aliguli Manay to Adu Huli Ata, it was a fun session where the children and adults even got to play a game or two. 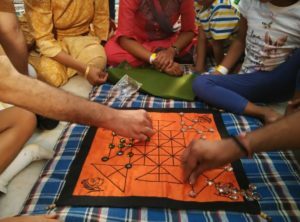 The team of RG Singh, Raghu Dharmendra, and Dileep Gowda have done extensive research on the traditional games, their use and their importance in our culture and have made their knowledge freely available to anyone who is willing to pay attention. 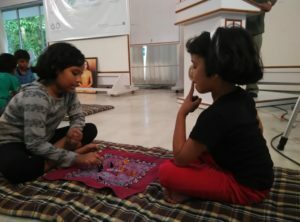 In this day and age where children are glued to mobile screens for hours together, traditional games offer a hope and promise of getting them back to an engaging form of play which are also designed to make them more mentally agile and fit. 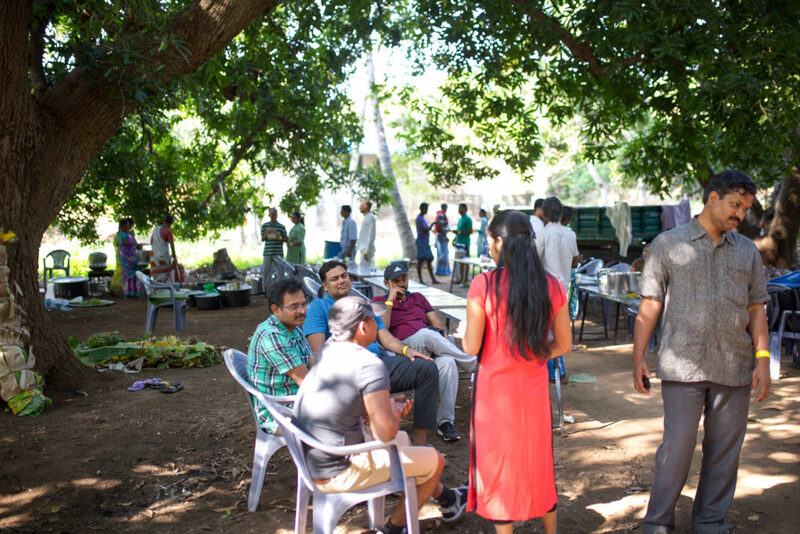 Do check out the Kreedaa Kaushalya team at their shop opposite Mysore Zoo or catch them at their blog here: http://kreedaakaushalya.blogspot.in/. And don’t forget to introduce your children to the rich game culture of India. 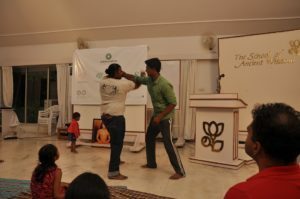 The next session was on Karathandavam, another martial art form of India. It was very interesting to learn about this ancient art and appreciate the beauty of many practices that were part of our culture. Meaning what’s there in the Macrocosm (the Universe) is what’s there in the Microcosm (The Body) i.e. man is a universe in himself. 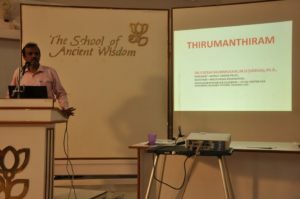 These lines were said many thousands of years ago by Siddhas (ancient Tamil Sages) – and it is being discovered to be true by modern scientists even as we read these lines today. Whether one views these lines literally or with more spiritual intent, it is certainly not something one can just understand in a day and gain mastery (in fact, nothing in life is like that, but these kind of topics definitely need their own time, effort and dedication to really understand, let alone start practicing them). 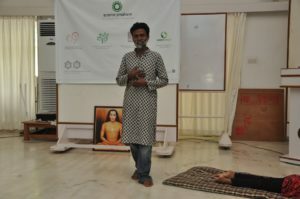 After that intense session, parent, healer and acupuncture therapist, Anandji did a light and simple session on Body, Mind and Soul – he gave us a very good understanding of the these three realms and even shared an easy way to meditate. 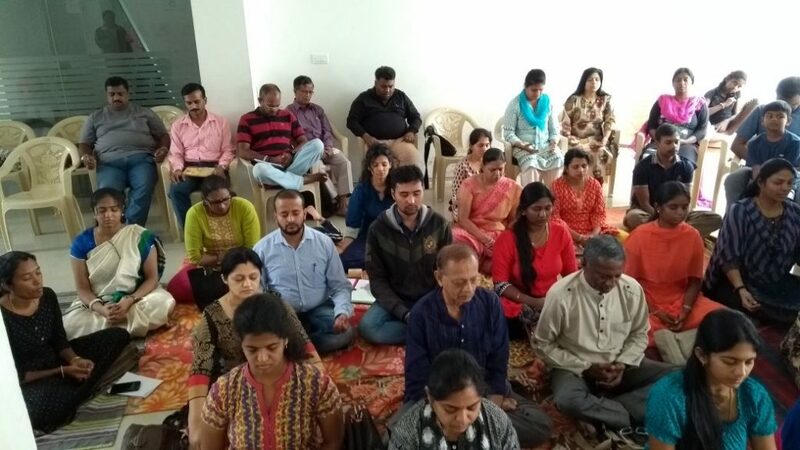 Thanks Anandji – it was indeed a new way of looking at meditation (where one just lets the thoughts flow without getting too attached and instead focus on “who” is having these thoughts). Post that, it was time for little Ishita’s first birthday celebration!! A celebration where everyone wanted to get as close to the birthday cake as possible!! 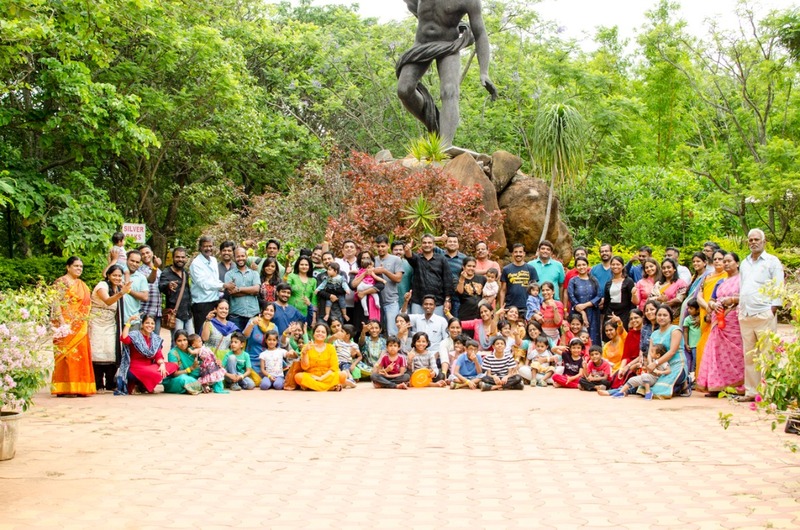 Joking aside, I am still in awe of the parents’ clear commitment and conviction towards holistic living (they sacrificed the usual first birthday celebrations and instead chose to attend the outing and celebrate the little one’s birthday with us). 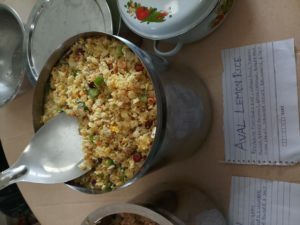 Anyhow, again on a lighter vein, thanks to dear Ishita and her parents, we got to taste one of the yummiest Millet based cakes made by parent Sharanya (again proving the power of parenting community coming together for the benefit of each other). God bless you, Ishita dear! Someone called for a quick group photo before Maranji takes leave. Check out the cute little guy striking a pose in the front! 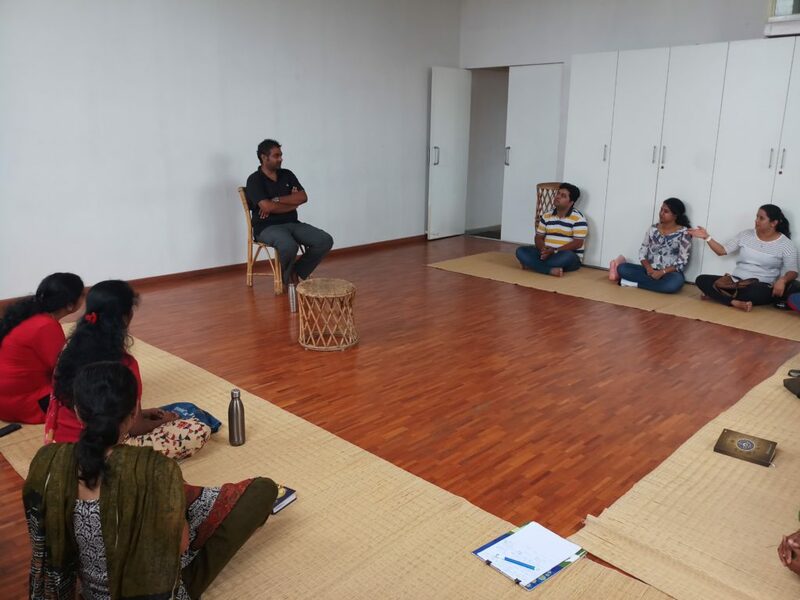 The day wound up with Dinner and another meditation practice session by Velu. This time, the meditation was focused on building a positive aura around ourselves, an energy ball of protection and good will. Suffice it to say, it was one of the most intense moments of my life! Beyond that, it is very difficult to write about what we all experienced – a mild sense of liberation, lingering joy and the thrill of having discovered our own mind power – definitely something to be experienced rather than heard from someone! It is a long journey from where this group of parents started 5 years ago, with 6 parents. 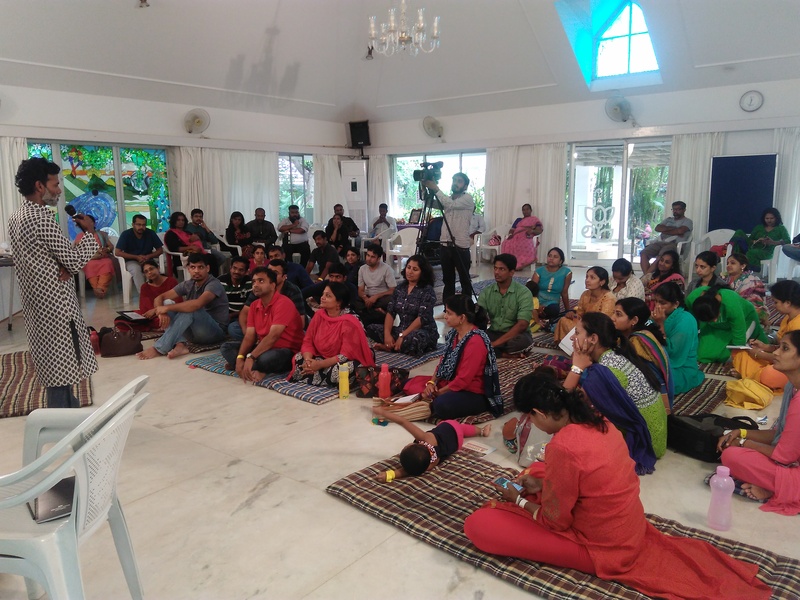 Today, as we stand, this group of like-minded people committed to nourish their kids and live a holistic life with ancient wisdom gifted to us by our ancestors, has grown strong with 6500+ parents and continues to grow on a daily basis. 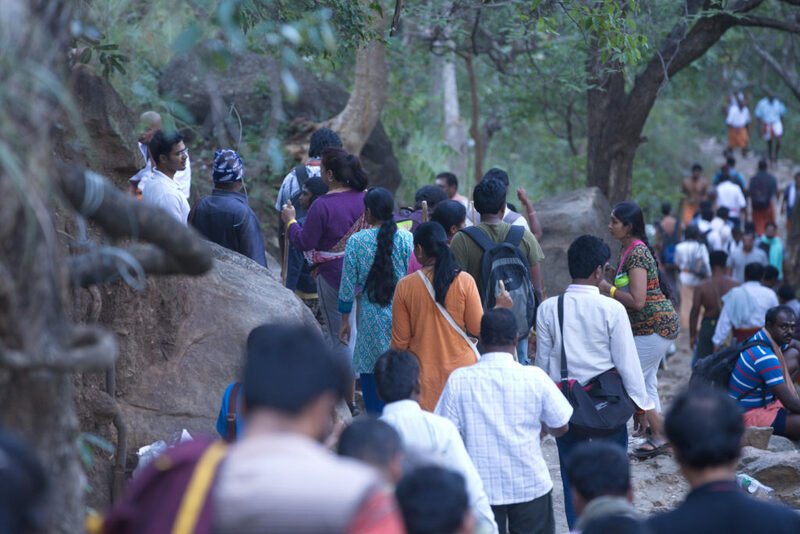 After the past Sathuragiri retreat, the community’s energy was so high and determined to meet each other and celebrate this 5th year. Happy to see parents in our community took ownership of this event, felt like a family get together. Some highlights of our WhatsApp post. The plan was to start, at 5PM on Friday, the unpredictable weather took over, many parents were stuck in traffic. So we had to delay, all kids found their ways to keep them busy. We started to introduce all the parents and their journey of how they ended up in our group. It was finally good to put a name to face. Gratitude to @Ananth who took a day off on Friday to make sure out station parents reach the venue safer. In parallel he took care of posters, banners, etc. @Ananth @Rajasaker @Mani made sure all the banners were fixed on time. Really glad to see @Nikitha Jain flew all the way from Delhi for this event, @Yoga Jothy from Hyd, @Saranya from Chennai, @Vijaya from AP. At the resort, we made a solid demand to replace 5 whites. Due to operations and financial issues, they could not do it. 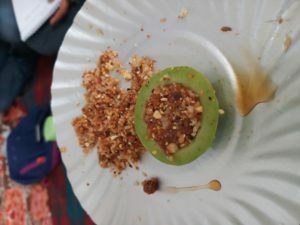 So from @Greenhands projects, we estimated the use of 2 poisons, white sugar, and white salt and replaced with jaggery powder and pink salt. 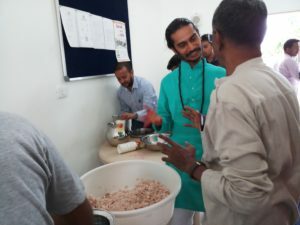 In the last min, we came to know from Greenhands team that jaggery powder was not available, @Ananth took charge and arranged 25kgs to the event. 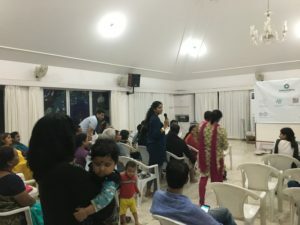 To make the check-in smooth, @Divya and @Priya planned meticulously to allot rooms in such a way that parents have their own space. Unfortunately, the resort management wanted to fill block by block not random rooms at different rooms. It was the time when most of the parents are stuck in traffic. Then we took help of the resort management and tried to rearrange the rooms. The SoAW was kind enough to offer to upgrade the rooms to accommodate for kids too. So all kids were given same coats, some even had extra beds. In parallel, we had plenty of issues to source 27 birth star trees, we had to refer back our blog to get alternative trees. 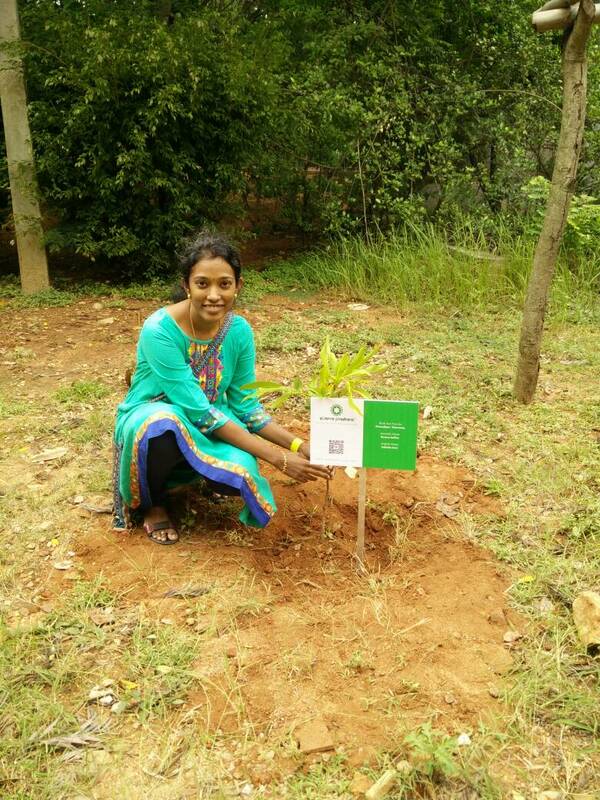 @SriNandhini did multiple follow ups with them to make sure we have all the plants. Finally when the plants arrived, none of the plants had a name tag. We had no idea which plant was referring to which star. @Divya and @Srinandhini spent nearly 3 hours to figure out while the session was happening. 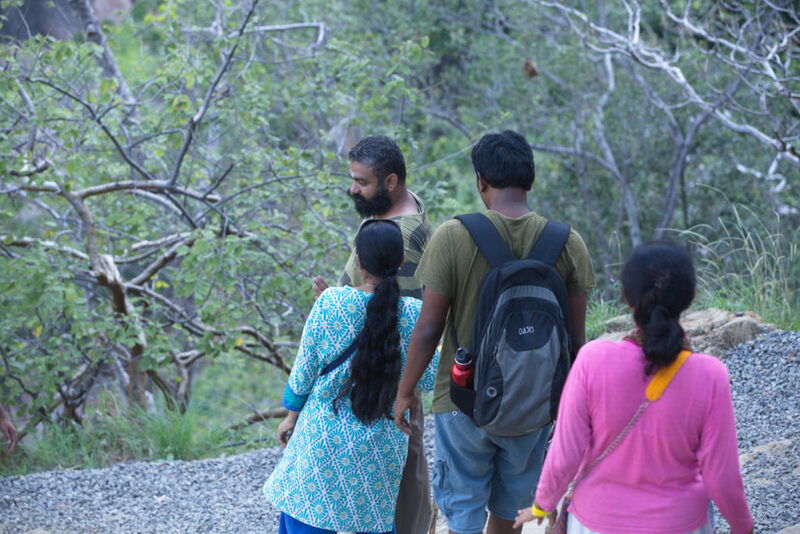 Luckily Dr. Shankar was of handy help, he was able to help us spot some plants. 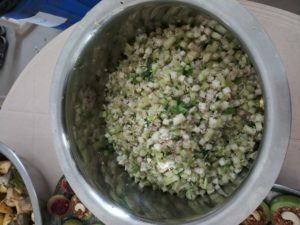 @Srinandhi also make sure all were given a small tulsi as a return gift. @Priya also sourced seed balls from chennai as an additional return gift. 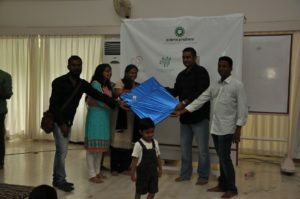 @Srinandhi @Divya – did an amazing work on getting those toys, stationery. They and other parents made countless shopping time for this events. 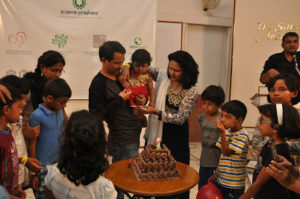 Parent Monika celebrated her daughter Ishitha’s First Birthday at the event. The first birthday is always very important and special to parents than kids. We are honored to see when parents decided to celebrate with like-minded parents and seek blessings. 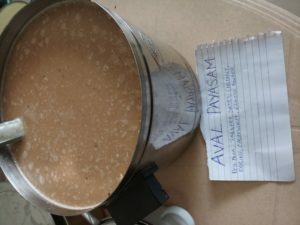 @Sarayna our Nala group active member (and Admin) took charge and experimented with Ragi and millets to make a healthy cake. 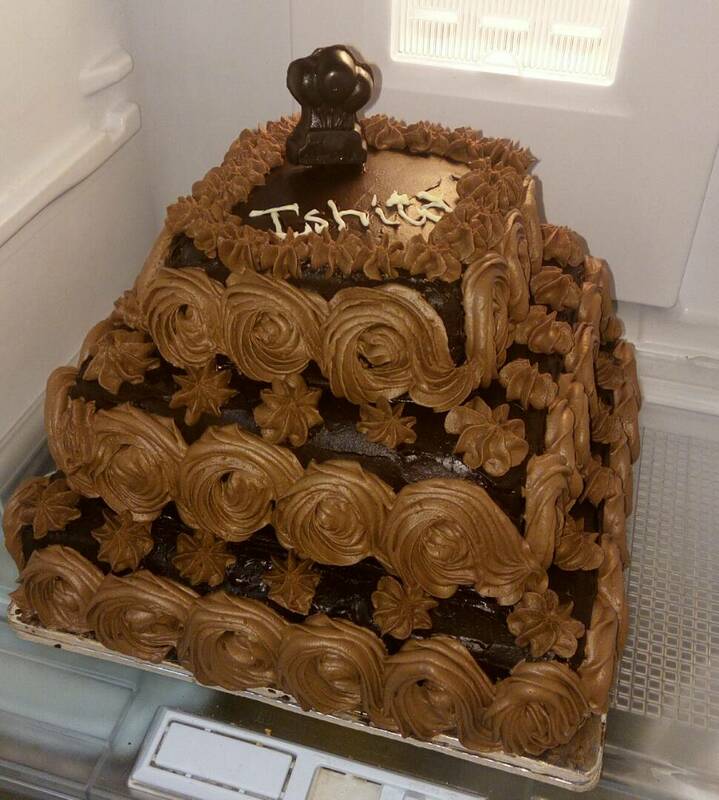 In spite of her daughter’s health issues, She personally baked and delivered the cake as a surprise. As the principles of reciprocity continue, @Monica arranged healthy sweets for all parents. 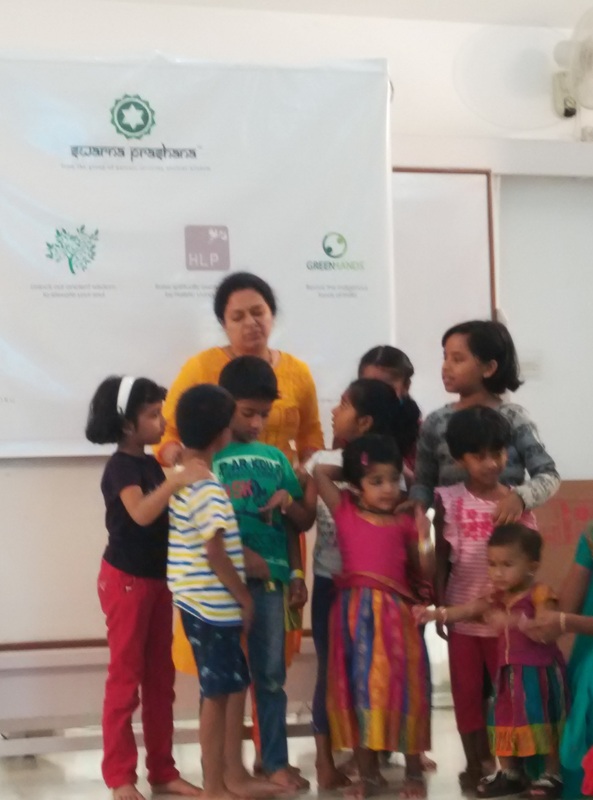 Within 10 mins, @Roopa took charge of all the kids and made them practice shloka. Along with her, kids did a decent job of chanting. Though all experts share their in depth wisdom, It was this humble healer, who stole the show! Though he is not fluent in other language than Tamil. His true intention, sincerely reflected in his voice and attitude. All our parents were breathless with his sense of humor and able to make his strong point in everyone’s mind. This is one of the reasons I wanted him to be the first speaker. (but have to make a switch in plan due to logistical reasons) @Gayathri did an amazing job to catch up with Maran ji’s high velocity speak into English. But many parents was able to make sense from his talk. His simple and effective solutions was an eye opener. 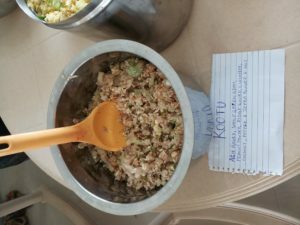 After his talk…Few parents immediately made a commitment that they would translate his recipe book into multiple language book. Though we know about the birthday we planned it well. 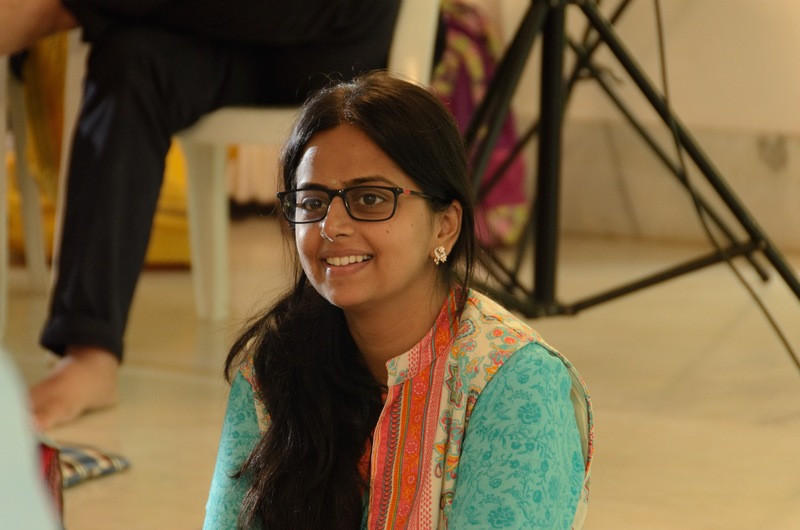 But one of our parent @Divya was celebrating their anniversary, came to us as a surprise. In the mid of chaos at events, handling guest, kids, other running issues, the core parents really hacked a plan to at least arrange a flower bouquet. 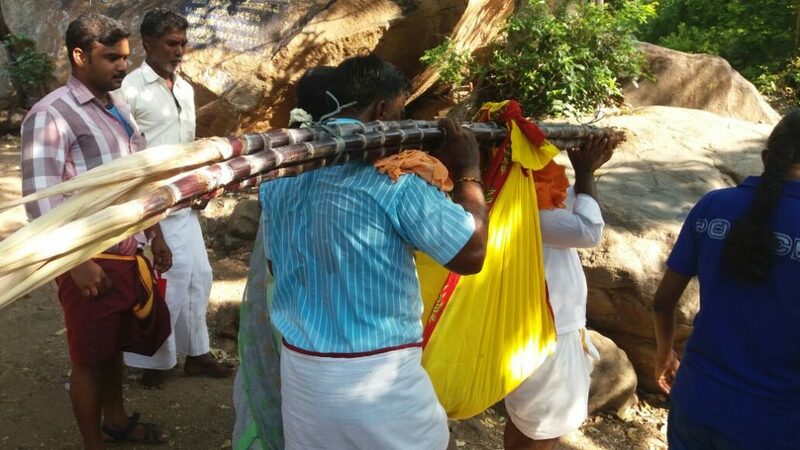 All parents showered flowers over the couple with their blessings. 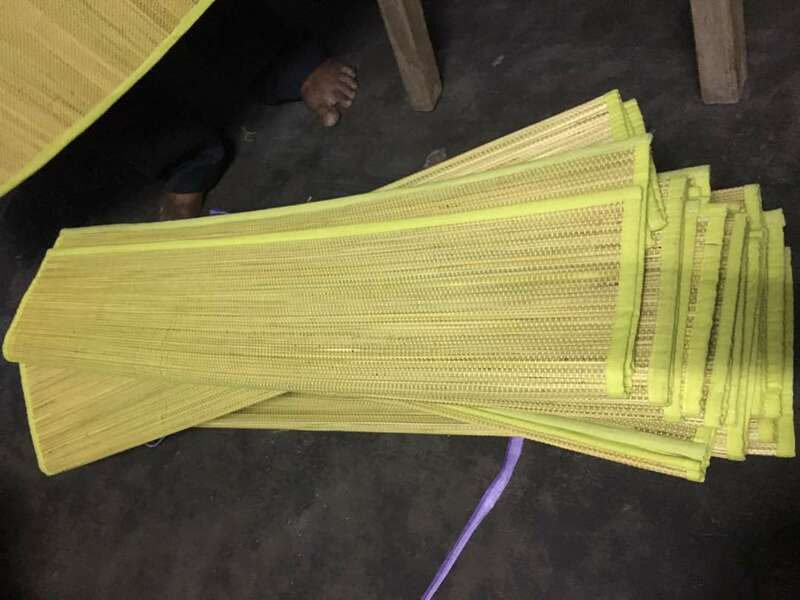 @Greenhands Mani later gifted Darbai grass meditation mat. 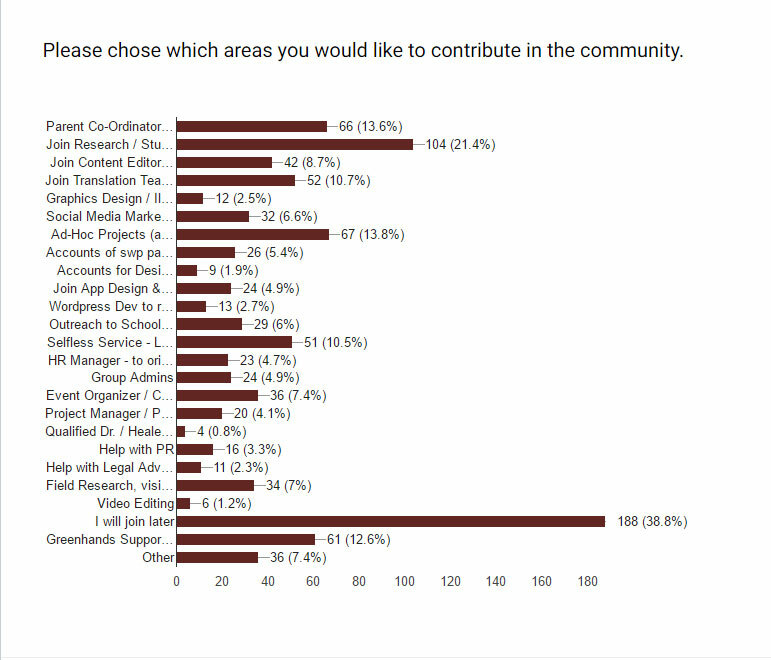 Yes @Divya it was a small gift from our community. 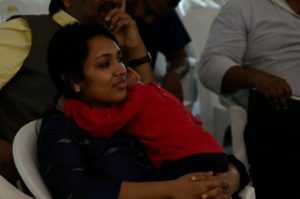 @Priya known as a please use reply button admins, really skipped her cousin’s wedding reception to hand hold our event, late in evening, @Saranya took charge of her to reach the wedding at night and @Priya ran back to the event after the early morning wedding. 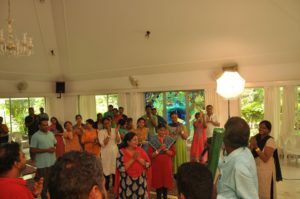 It was nice to see the energy of parents clapping and making notice like a movie experience. 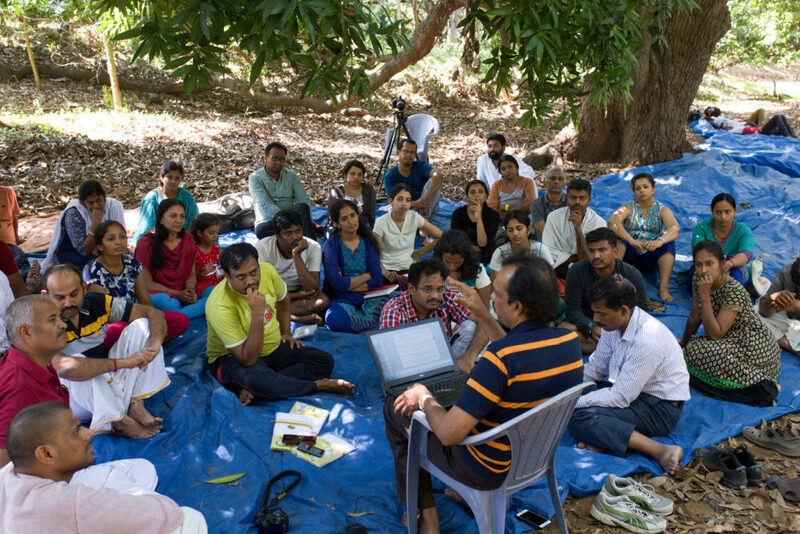 The first draft copy of the footage of our recent Sathuragiri retreat. Personally, the video has some elements like swp talk, and my long thank you note etc.. I felt this is not in context with the motive, so we will edit it and add some more footage of parents and publish it in few weeks. 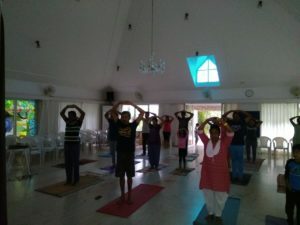 Bhooma Balaji supported us in conducting the amazing Yoga session in the morning, since our Yoga expert could not make it at the last moment. Pottery session was enjoyed by both kids and adults. 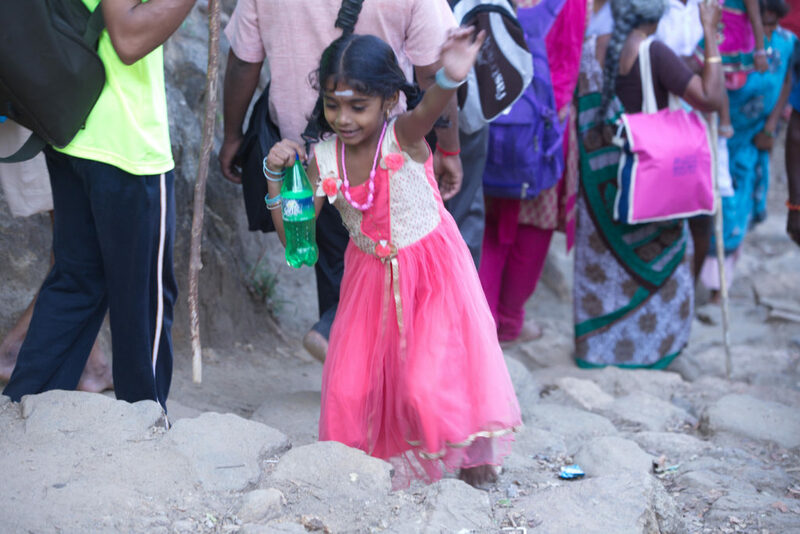 Nadiyan Divya’s hubby, took the initiative to take a child to the hospital due to unexpected emergency. 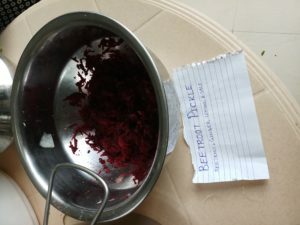 Shilpa’s mother was so thoughtful by sharing her homemade Marmalade pickle to our parents (Sunday lunch table had that). Efforts of Raja by running multiple times for all the physical work. Mani and Raja at the second day, gave their rooms to the camera crew and adjusted in a hall. 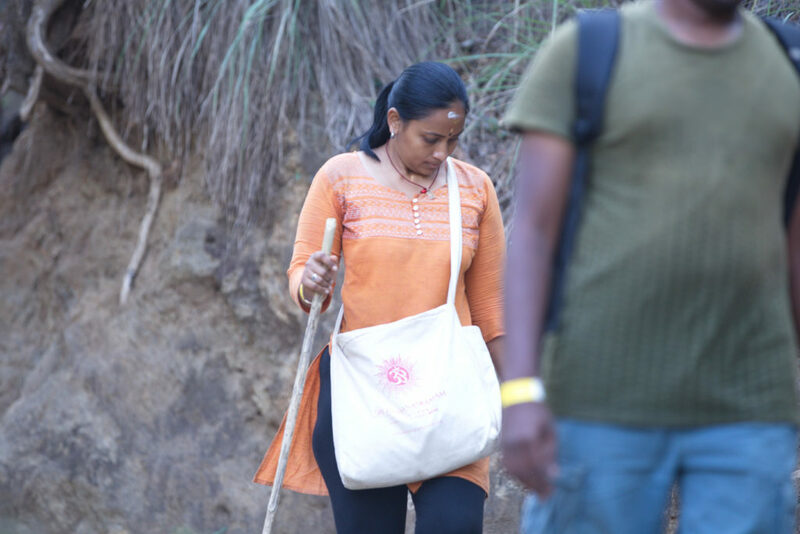 Healer Sangeetha Shah, only member outside the group who listened to her intuition and took part of our celebration. We identified nearly 40 parents from the 1000s of parents who did the little things that mattered to the community. Parents who made it to the event received their awards. For parents who did not make it to the event, once we have enough budget, we will post it to your house soon. A detailed post is on the way about this tomorrow. There are many untold stories to share about this landmark event of our WhatsApp group. I tried to bring that I could recollect quickly. I might have skipped some, this does not mean their work is unnoticed, it is just my memory (RAM space is limited). 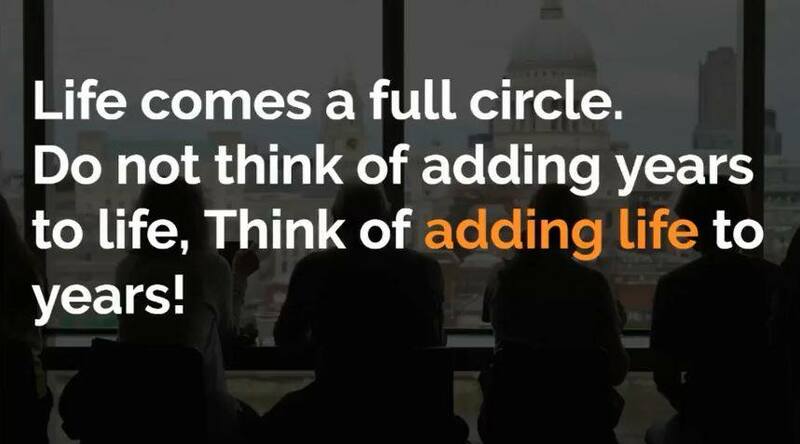 Moving forward, As core group is restructuring, we decided to be more of quality focused and removed parents who do not follow group disciplines. The idea is reduce the group size and keep only like minded people who are serious about holistic living. 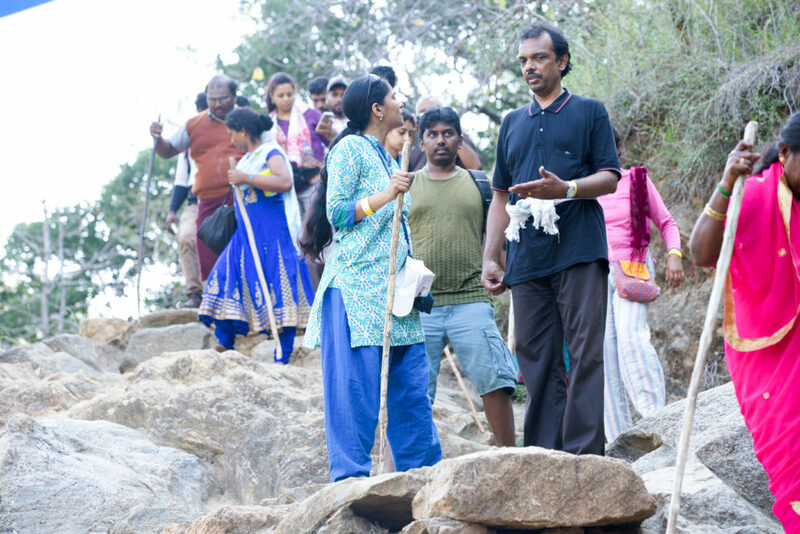 Sathuragiri – Season1 – Random Clicks. 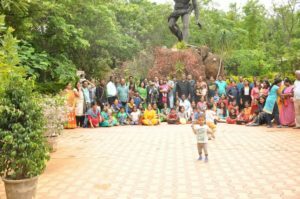 Author Velu JayaprakashPosted on April 5, 2017 April 5, 2017 Categories In Media, MeetupsTags Sathuragiri-Season1Leave a comment on Sathuragiri – Season1 – Random Clicks. 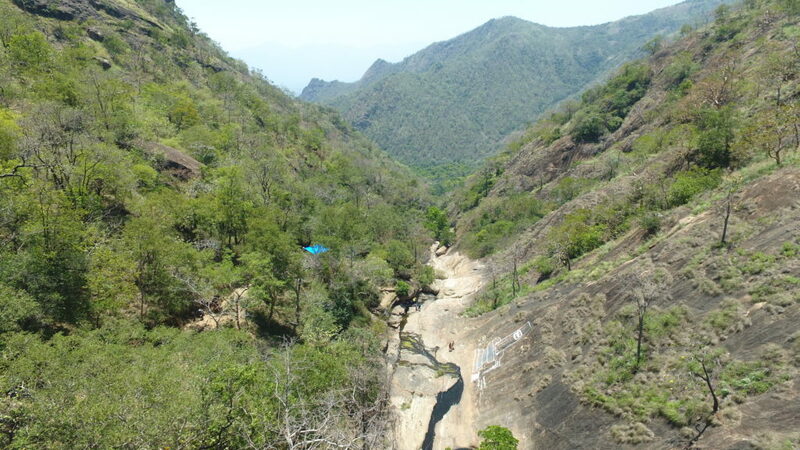 My discovery of Sathuragiri has just begun. 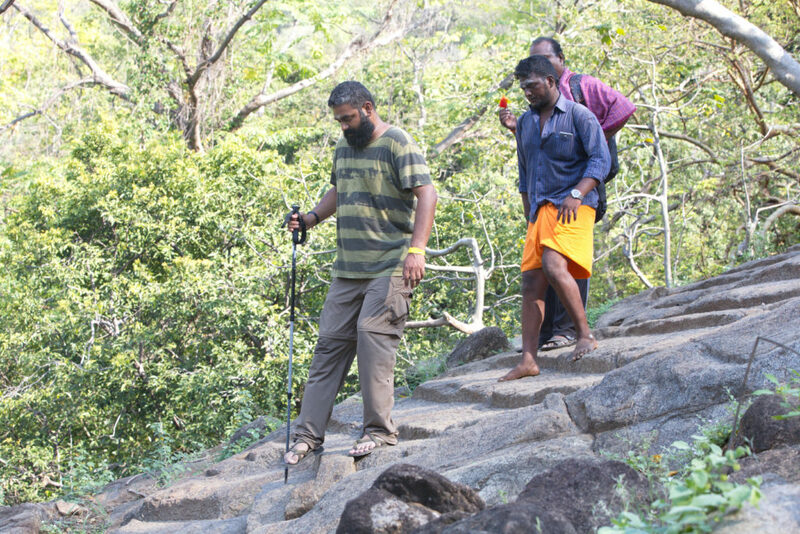 When Velu Jayaprakash, the author of Swarnaprashna.org, brought up the idea of visiting Sathuragiri Hills, I found myself instantly agreeing to go on this journey. It was an idea thrown open to all members of our whatsapp group, that have come together to discuss ancient sciences and holistic parenting. Unlike myself, to agree so readily to undertake a journey of this kind with people I have not met before, but the idea was very exciting and I had immense clarity that this is a trip that I must take. 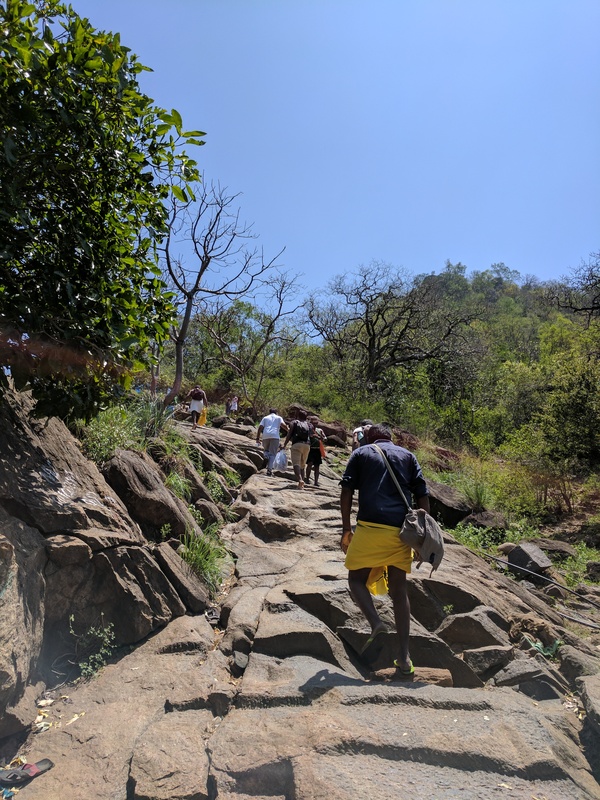 I chose to drive from my home in Bangalore to Virudhunagar, a small village about an hour’s drive away from Sathuragiri Hills. I spent the night there at a hotel, waiting for the rest of the group, who were to arrive the next day morning. I woke early next morning and waited for the group to meet me enroute. 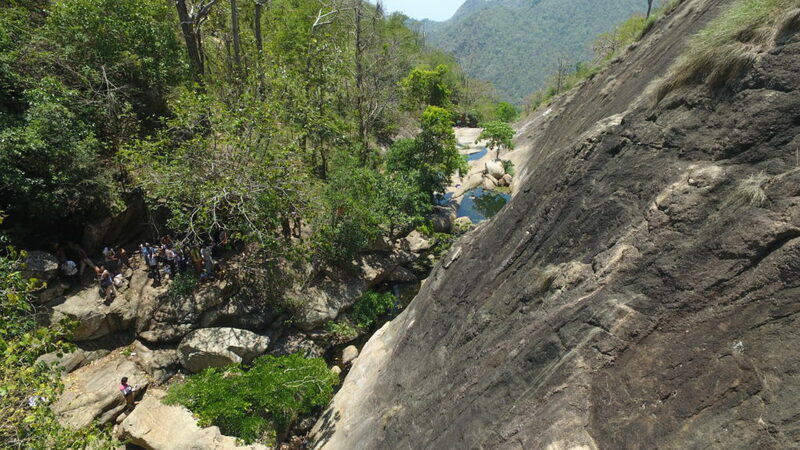 The drive from Virudhunagar to the base of Sathuragiri was itself very pleasant. This small village had plenty of temples, all washed clean while the incense of sambrani and camphor wafted through the air even before sunrise. Small houses with cow dung cakes on the wall had roosters crying out loud to welcome a brand new day. 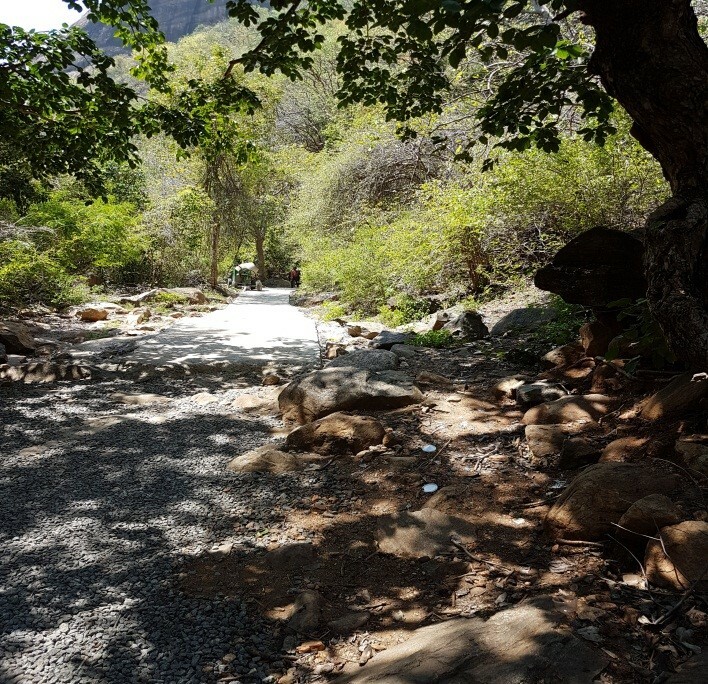 We reached the base of the hills and were ushered into a beautiful mango grove, that was our base camp. The mango grove was a very relaxing place, filled with age old trees with trunks so large that I could not get my arms around them. 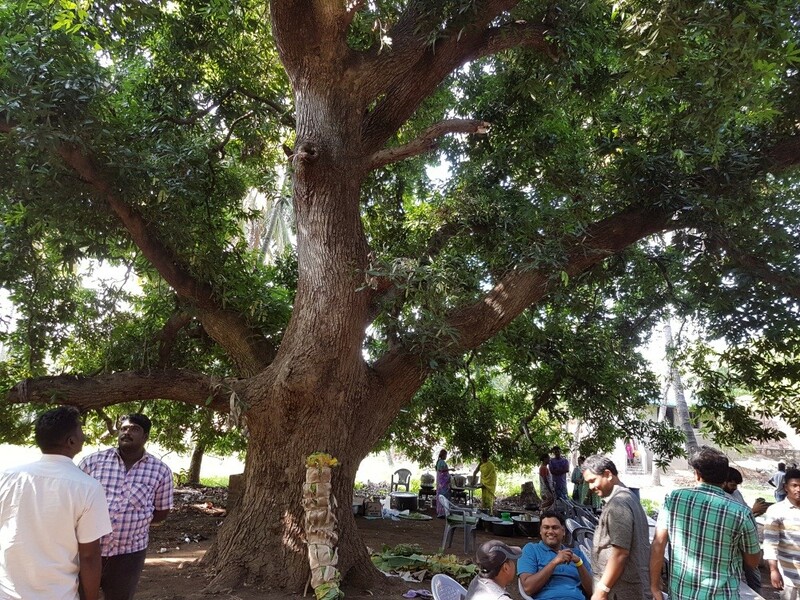 Each tree was organically grown and was in prime health. 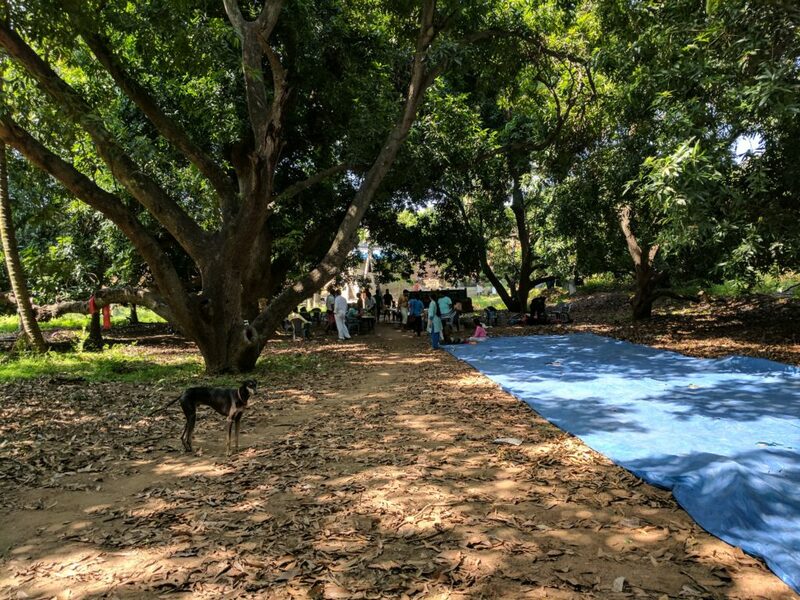 Few friendly Rajapalayams (Indian Sighthound) scampered around me pouring out their love. It was here that I finally met people in the whatsapp group, who were till this point just intelligent posts and a display picture. 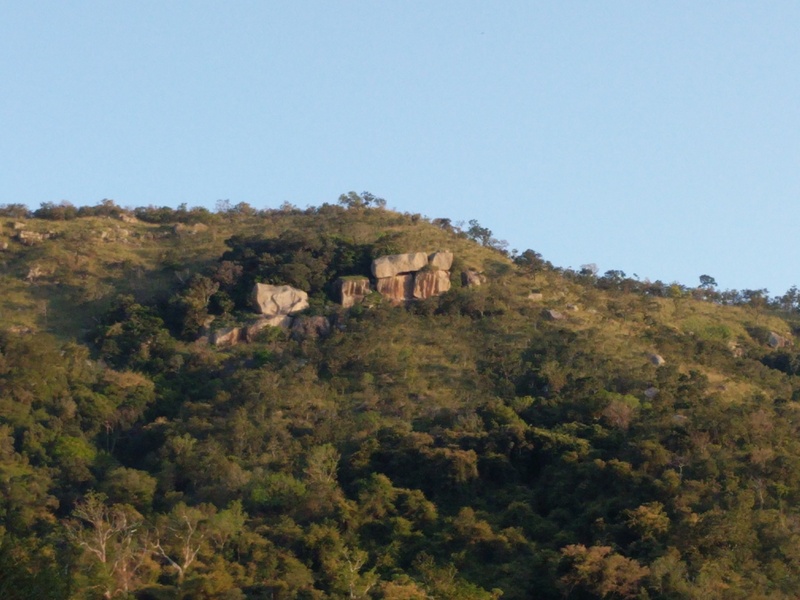 A few minutes walk from the mango grove stood the majestic Sathuragiri Hills. There was a car park at the base with plenty of small shops around. These shops sold everything from sambrani, incense sticks, japa malas and figurines of almost every hindu deity that one could think of. 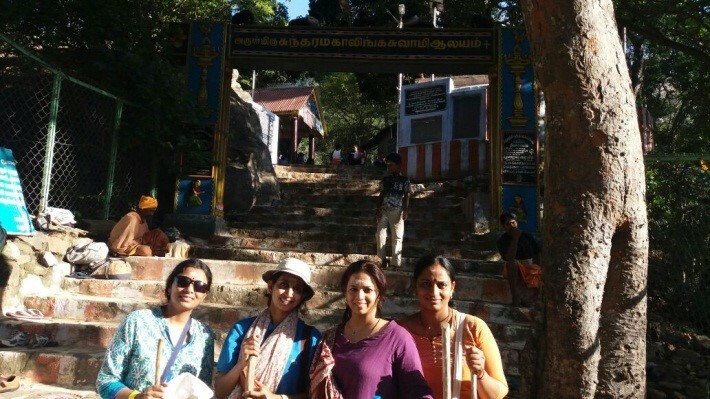 We began the trek and just a few steps ahead we found a small Ganesh temple. The priest showed aarathi to the deity and filled my hands with a generous amount of divinely smelling vibhuthi. I said a silent prayer that my experience at the hills would be blessed. The path was lined with people in saffron robes begging for alms. While some looked extremely pious, it was certain that the rest were there only to make a quick buck. I did not feel particularly interested in any of them and simply walked past. 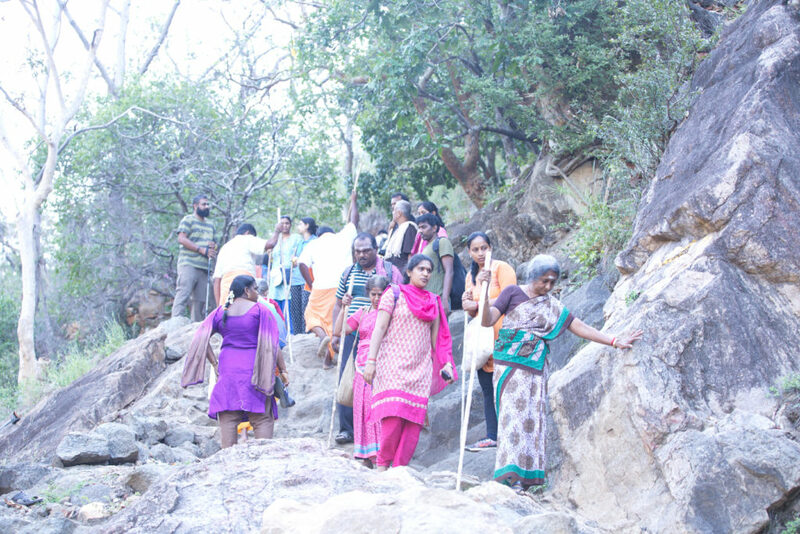 Initially, the trek seemed very easy. 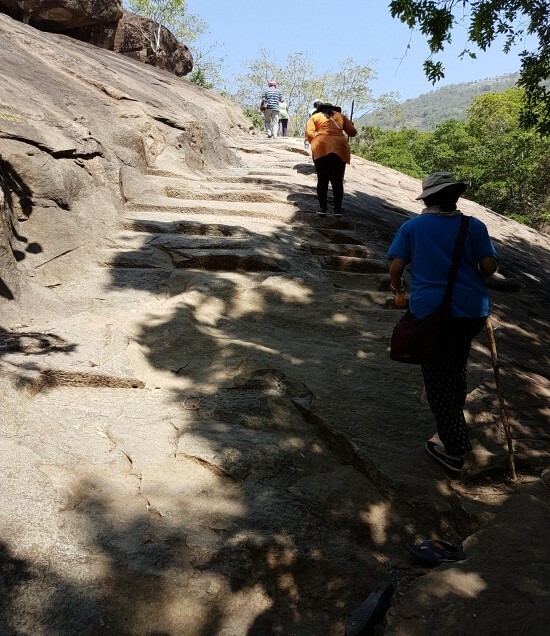 The track was neatly laid granite with a step up every hundred meters. “Not bad at all” I thought aloud. We soon encountered a small mound that we had to walk around and then more steps, although this time around, it was cut out of solid rock. 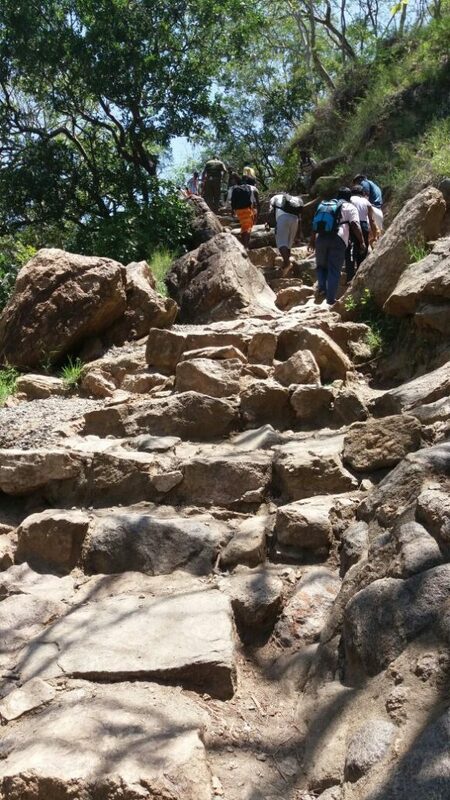 Soon the steps stopped exposing a steep terrain of jagged rocks. The path was fairly crowded. I was informed that the crowd was due to ‘Shani Pradosham’, an occasion according to the hindu calendar. Well, our group did not come here because of this auspicious time. 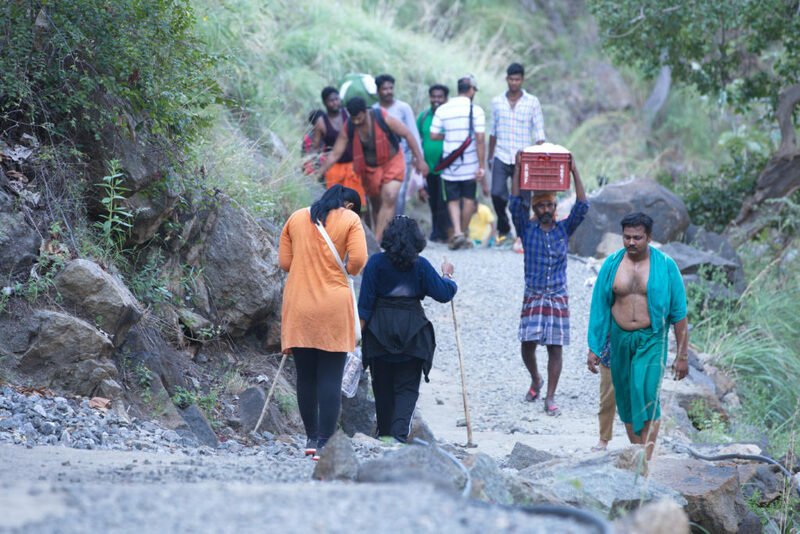 So let us just assume that the universe intended for all of us to be at Sathuragiri at this very particular point of time. It was just past noon and was getting very hot. The group began to scatter, each one going according to his or her physical capability. 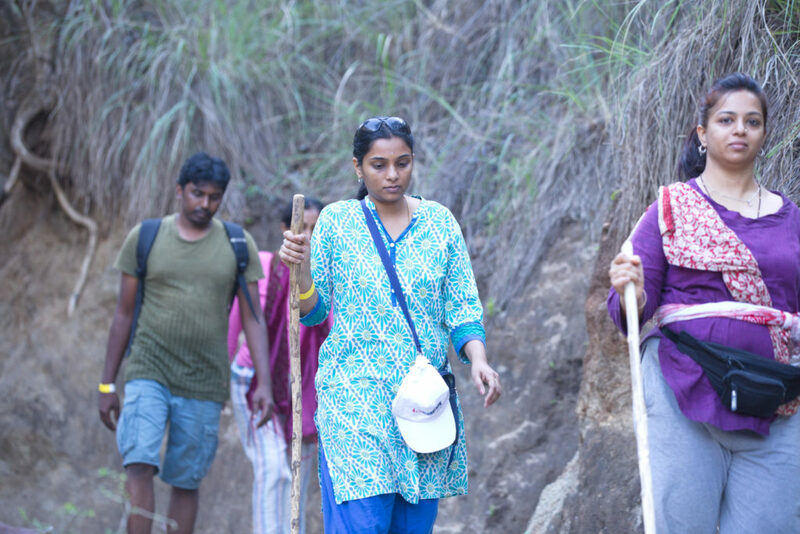 The trek was gruelling at some points, very steep indeed, and then relaxes to an almost horizontal path. There were few small shrines along the path, some seemed very ancient while the rest seemed like recent add-ons. As I walked on, I reached the Naaval Ootru. 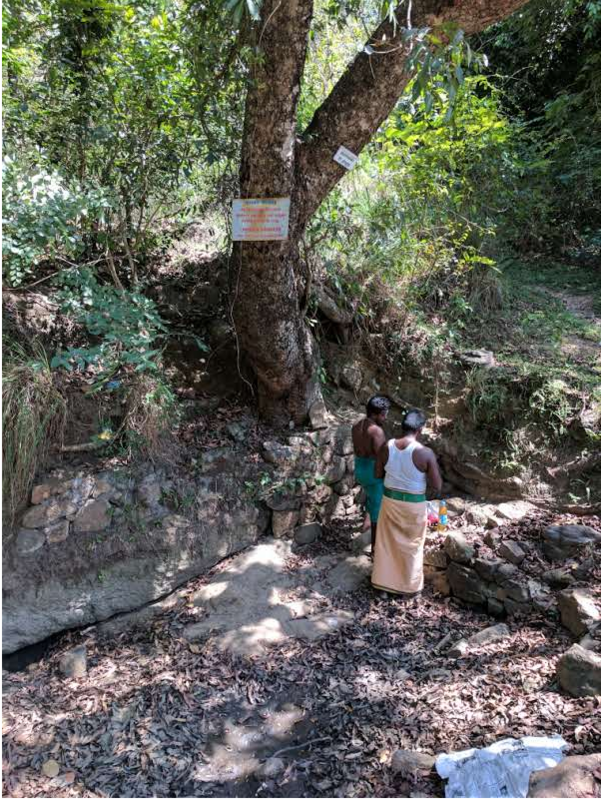 A small pond most often filled with sacred water laced with miraculous herbs. Sadly, I saw an dry, empty pit. 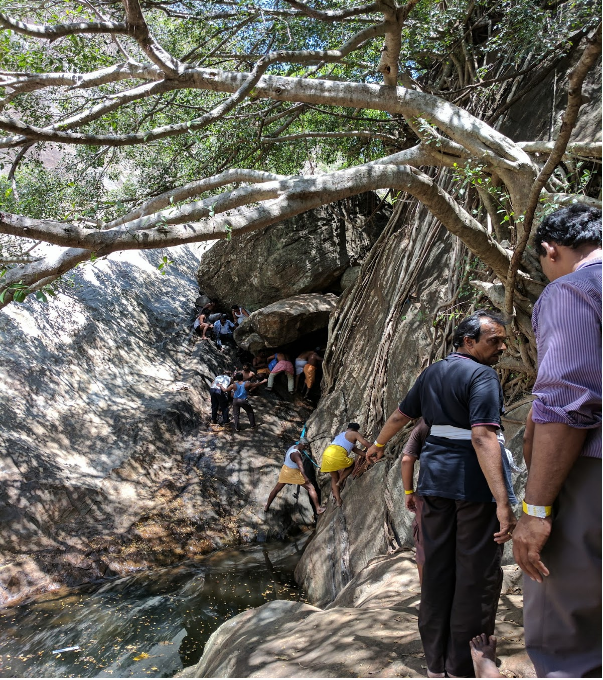 I expected Sathuragiri to have more water all along. I was hoping to see gentle brookes and a cascade of water falls here and there. But the stark reality of water shortage struck very hard. How we human beings are sucking the planet dry would call for another deep discussion. 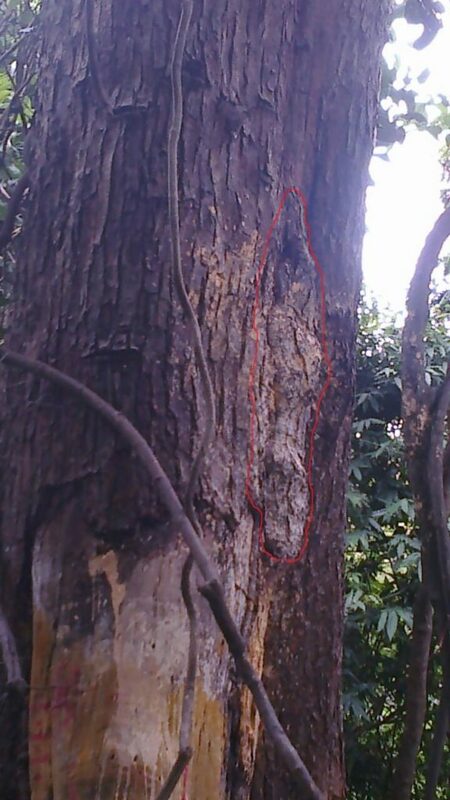 The picture below shows the roots of an old Jamun tree, usually these roots are submerged in the natural pond. 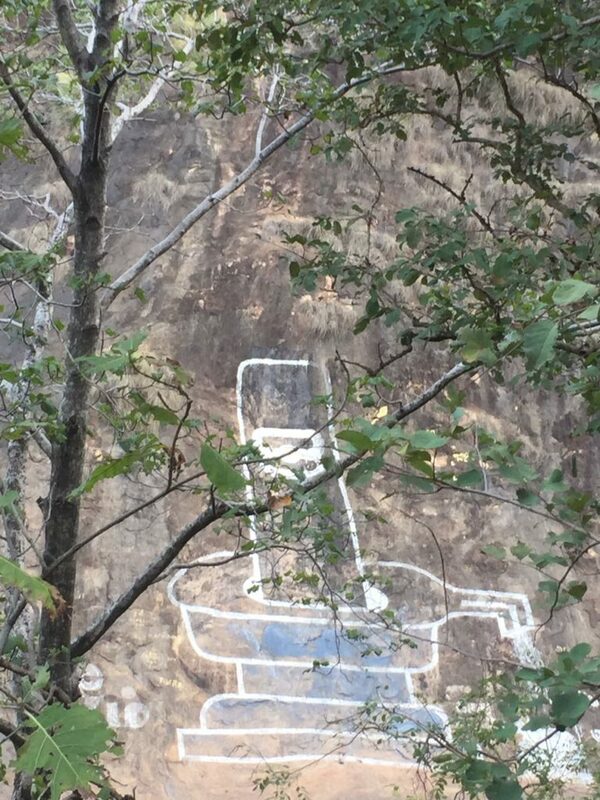 I then reached the Pathanjali Lingam, a cave with an age old lingam,that featured at the end of a very slippery terrain of rock.The only grip being some roots of trees. Much deeper, were some ropes tied together to help the adventurous folk along. There seemed to be some water flow in this region. I could not muster up the courage to jump in the water and wade my way to the cave. A decision that I regretted almost immediately. 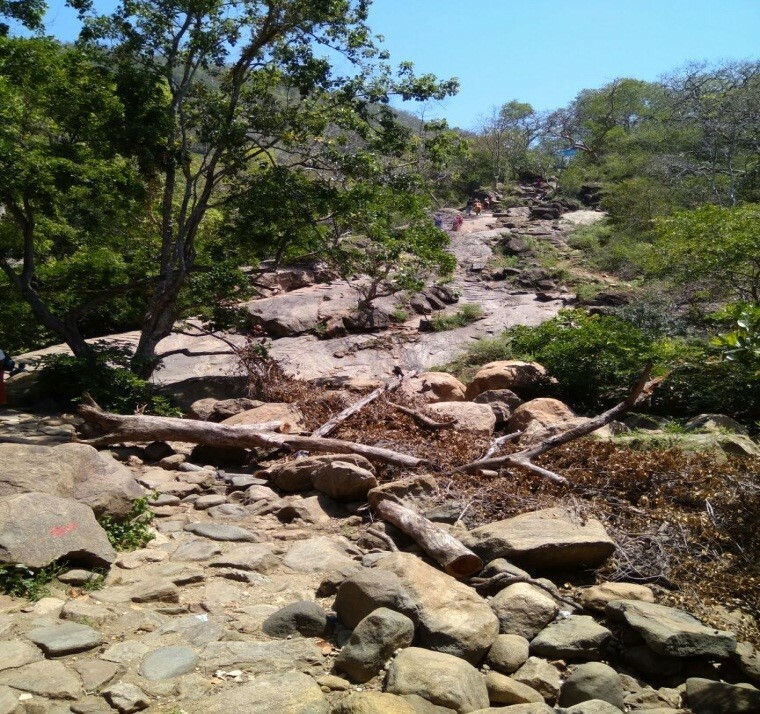 As I climbed higher, I found a tribal woman plucking some leaves from a tree. On looking closer, I found these to be Bilva patra (Aegle marmelos) commonly known as Bael. A traditional medicinal herb most often used in any ritual to appease Lord Shiva. I also noticed creepers and shrubs of Shankapushpi flowers (Convolvulus pluricaulis) growing wild. Their white and purple hues breaking the monotony of rock and green in all its splendor. These conch shell shaped flowers are also used in the worship of Lord Shiva. 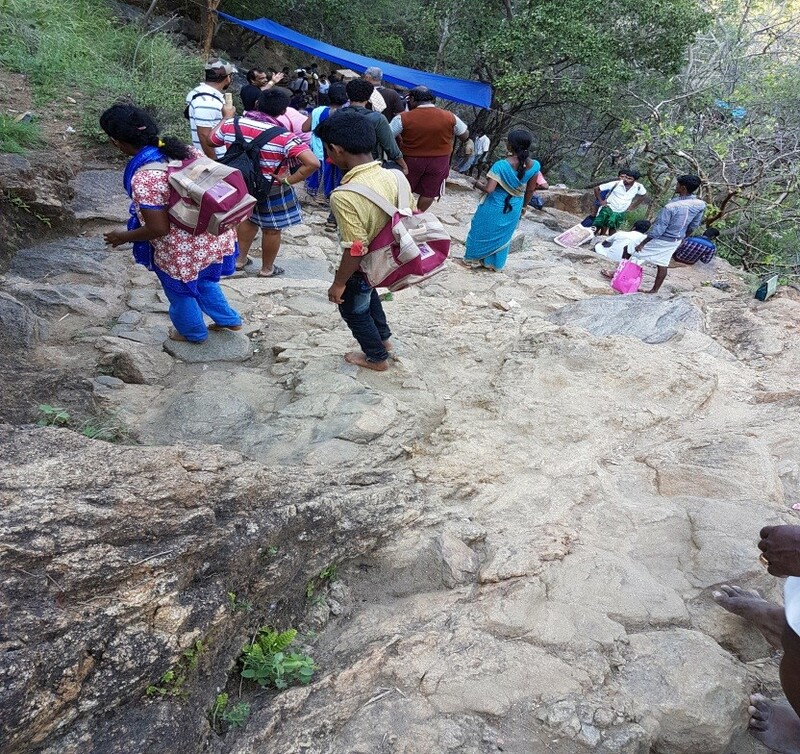 Sathuragiri Hills is a treasure trove of medicinal herbs, I hope to do a more detailed study of these herbs some day. Further ahead, I caught a glimpse of Thavasi Paarai, the abode of siddhars, still known to meditate here. The route is fairly inaccessible. I tried to find out if there was a way to get there, but most people said it was too dangerous. We finally reached the summit. 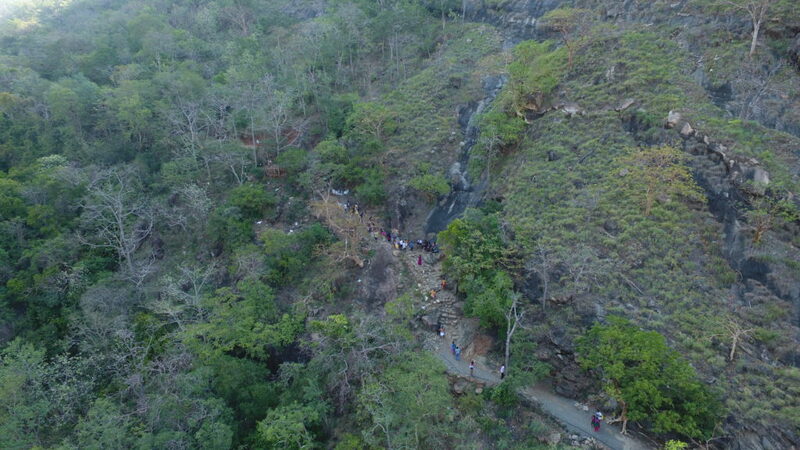 It was very crowded On the right paved the way to the Sundara Mahalingam Temple and to the left, the Santana Mahalinga Temple. I first chose to visit the Sundara Mahalingam temple. It was packed with people who were chanting bajans in praise of Lord Shiva. I chose not to go further when I heard the crowd would clear soon. We as a group intended to stay over night so I always had the option of visiting later and have a quieter moment. Near the shrine there was a medium sized room with a back door that opens to a wash yard and open forest. This is called the kanji madam. This place was brimming with hospitality and gratitude. 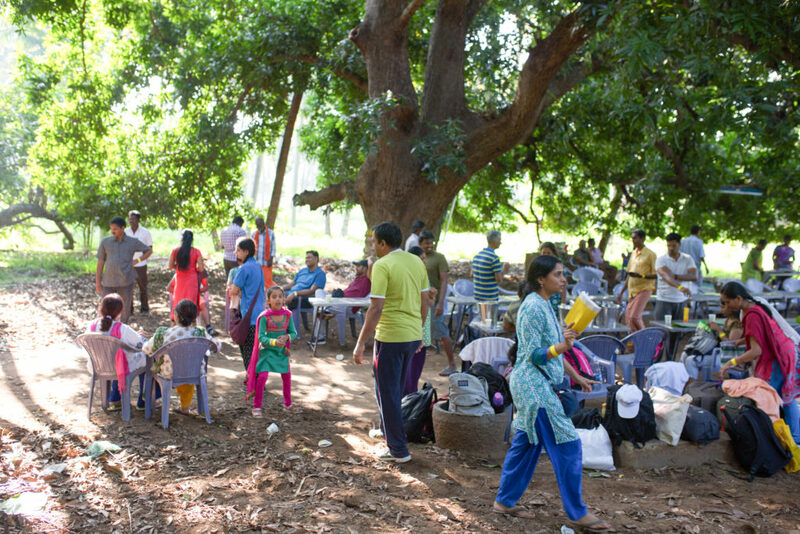 Every half hour, a volunteer at the temple would come out and extend a warm welcome to all passersby for a delicious meal. They addressed everyone as ‘Shiva’ here. The meal is absolutely free of cost, however one could leave an offering if they chose to. We then went to the Santana Mahalinga Temple. I was able to visit this shrine right away. A simple and beautiful place. I enjoyed witnessing the aarathi and exited the temple feeling blessed. It was evening now and it was getting dark very rapidly. The group had found a hall nearby to rest in, but however I felt the need to find a possibility of sleeping out in the open. 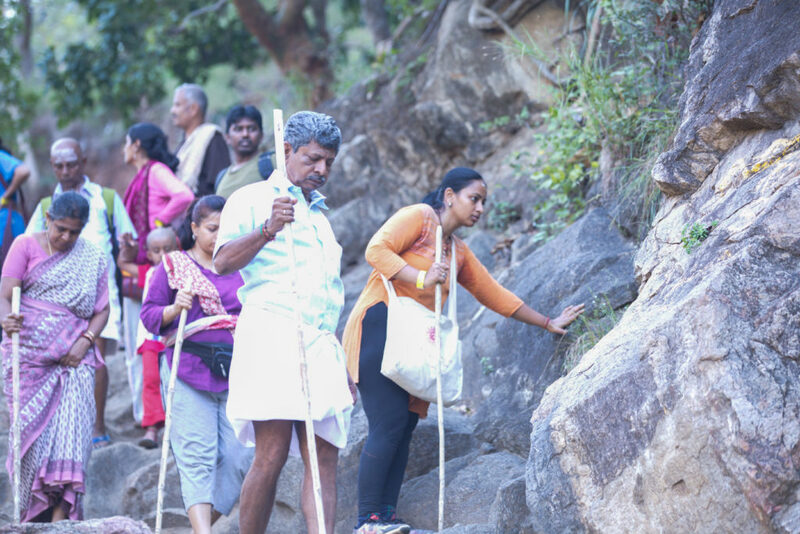 I walked back to the Sundara Mahalinga Temple. Most of the crowd had cleared by then. I entered the shrine and found a beautiful Lingam at a slant, decorated with flowers and tulsi leaves. After aarathi, I left the temple and for no apparent reason, I looked up at the sky. It was sprayed with glittering stars. I have never seen the sky so spectacularly beautiful. Amongst the cosmic dust laid the crescent moon just four days before Amavasya. 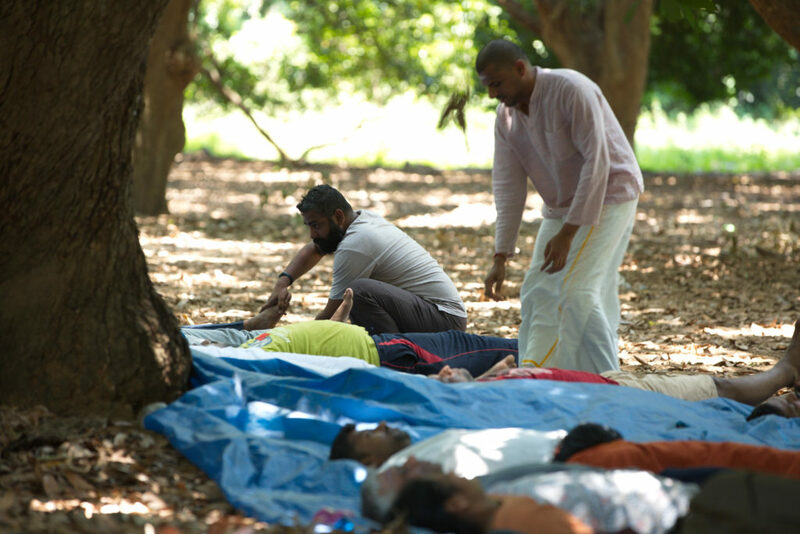 I sprawled my bedsheet on the pavement outside the temple and gathered some rest. Not the best sleep, but it sufficed. At 3;30 am, I woke to find myself blanketed in mist. Again volunteers at the temple were inviting passersby, this time for some piping hot coffee. It was certainly welcome and soothing. I found myself a spot directly opposite the Mahalingam. There were about fifteen people meditating there. I sat there and closed my eyes. I went into a very deep meditative state. Peaceful, Silent, Bliss are words that could come close in describing how I felt that very moment. I strive to get this state of meditation when I practice back home in Bangalore. At times I cannot even come close. I presume, that’s why the knowledgeable siddhars still choose to meditate on these hills. After meditation I briefly met the group and started descending while it was still dark. Dawn breaking at Sathuragiri is spectacular. A feast for all senses. The sky broke into a deep orange and there were hundreds of birds all chirping at the same time. I just paused there to soak up every bit of this beautiful experience. The descent was very rapid. At times I had to check my speed and slow down on purpose. After a very few breaks, I reached the base. I bowed down at the Ganesh temple where I stood the day before, feeling a deep sense of gratitude and achievement. I was expecting myself to be overcome with fatigue but surprisingly, I felt rejuvenated. 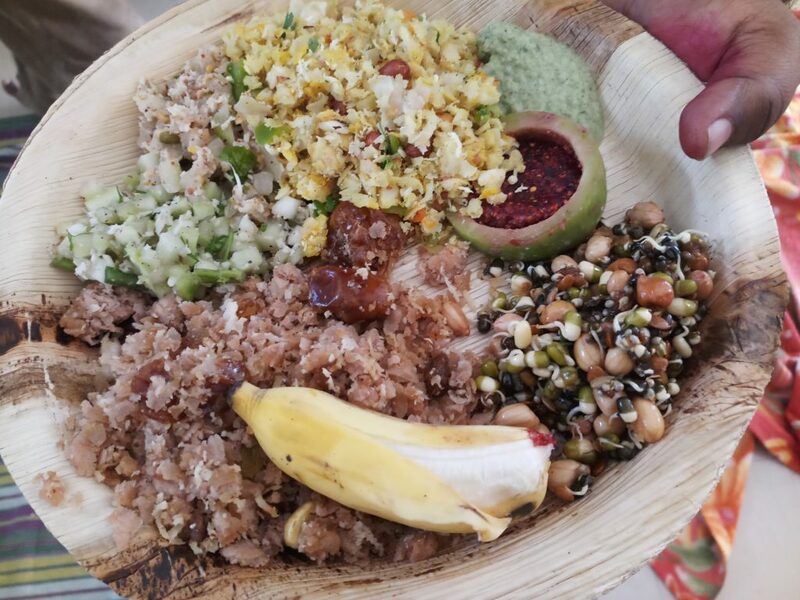 After a scrumptious breakfast at the mango grove, we were addressed by Dr. Selva Shanmugam, a professor of Siddha medicine. 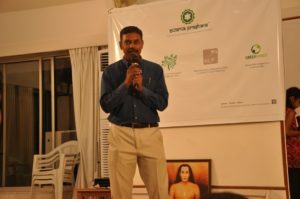 An honest and humble individual who explained how to incorporate the science of siddha into our day to day activities. The more I heard, the more I understood that although Siddha is such a deep subject, the philosophies are very simple and could be easily woven into my city bred life. The time had come where I had to leave. On the drive back home, I was listening to some soulful music, while I asked myself… ‘would I do this again?’ My mind instantly portrayed a picture perfect of all the minor difficulties I had during the trip, but deeper within there was an assured feeling that I would most certainly return. 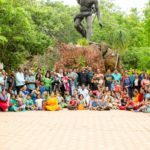 Author Prasad NaiduPosted on April 5, 2017 April 5, 2017 Categories In Media, MeetupsTags Sathuragiri-Season1Leave a comment on My discovery of Sathuragiri has just begun.